Engines that were in popular use during the span of this works were incredibly numerous and varied. As with aircraft builders, it was a time of free-for-alls calling for experimentation, conversion of whatever was handy, and pure invention. Some that were born early in this era are still around, but most are history. With the exception of foreign engines, these entries served the majority of cases. AeroFiles' coverage of jet engines is currently in development, and preliminary work can be seen here. Special credit and thanks goes to Clyde Bishop, who dropped by recently with a marvelous old book, the 1921 Airplane Engine Encyclopedia by Glenn Angle, packed with info about early powerplantssome of which we had never even heard of! Most of the old graphics of engines seen here are from that treasury. Listings show model designation (bold face) and year of first manufacture (c. = circa), ATC/Group 2 Memo (in parentheses), basic horsepower, displacement, number of cylinders and type: A = air cooled; H = horizontal; I = inverted; L = inline; O = opposed; R = radial; V = V-head; W = water- or liquid-cooled; X = X-head. Designer of record is underlined; ?? = unfound or uncertain data. Ace American Engr Corp, Horace Keane Aeroplane Co, North Beach, Long Island NY. 1919 = 40hp 4LW. Horace Keane. Converted and modified Ford T.
ACE 1928: American Cirrus Engines Inc, Belleville NJ; 1929: A.C.E. Corp, Marysville MI. LA-1 19?? (ATC 31) = 140hp 7RA. Evolved into Jacobs LA-1. Mk III 1929 (ATC 30, 44) = 90hp 310ci 4LAI; (44) for 110hp supercharged model. Mk III Hi-Drive 1930 (60) = 95hp 310ci 4LAI. ACT c.2000 Aircraft Cylinder & Turbine Co, Sun Valley CA. R-1340 Super 600 2001 (TC --) = 600hp modification of P&W R-1340 with R-2800 cylinder heads. Adams-Farwell Adams-(F O) Farwell Co, 21 Athol St, Dubuque IA. 1896 = 3RA. 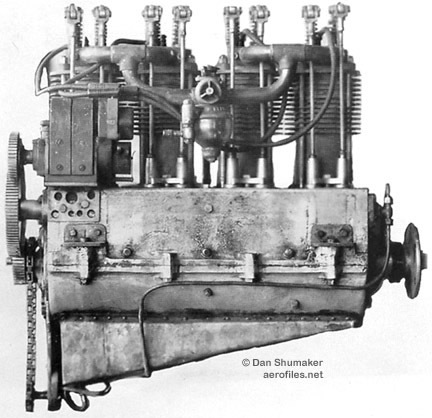 The world's first successful rotary engine first became a 1903 bus motor. The theory and design was in turn copied liberally by French engineers attending the 1913 Chicago Auto Show, appearing later as the Gnöme rotary. 1907 = 63hp 621ci 5RA rotary; dry wt: 250#. Emile Berliner. First flying rotary (Berliner helicopter, 1907). 1909 = 36hp 248.25ci 5RA rotary. Steel cylinders with no cooling vanes. 1909 = 55hp 541ci 5RA rotary. 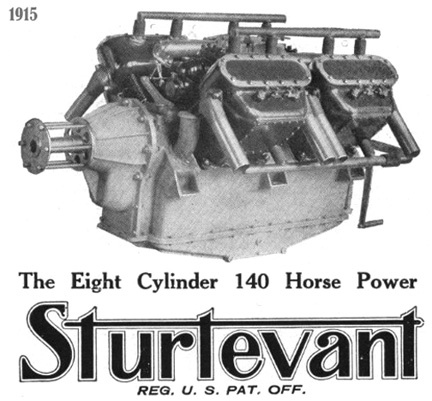 1910 = 72hp 843ci 5RA rotary, increased later to 135hp. Dry wt: 285#. Double Rotary 19?? = 280hp 1017.9ci 6RA rotary; dry wt: 279#. POP: 1. ADC Aircraft Disposal Co, no location. 19?? = Conversions of British Cirrus. 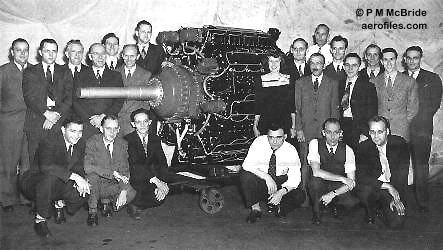 AEADC Aircraft Engine & Accessory Development Co, Jenkinstown PA.
Gryphon M, O-510 1932 = 150hp@2000rpm 511.1ci 8HOA; dry wt: 420#. Gryphon N, O-810 1932 = 225hp@2200rpm 811.1ci 12HOW; dry wt: 500#. Aeromarine 1914: Aeromarine Plane & Motor Co (fdr: Inglis Uppercu), Avondale NY; 1917: Keyport NJ. 19?? 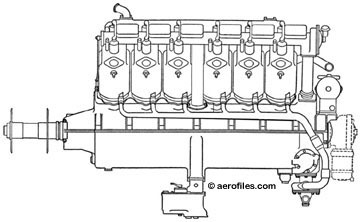 : Burnelli Aircraft Ltd.
1914 = 85hp@1400rpm 449.16ci 6LW; dry wt: 430#. Geared version was K-6. 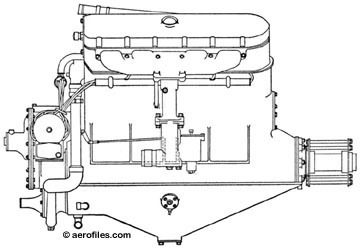 AR-3 1931 (ATC 74) = 50hp 3RA. AR-3-40 19?? (ATC 119) = 40hp 3RA. AR-5 19?? = 65hp 3RA. B-45 1915 = 150hp@2275rpm to 170hp@2635rpm geared 8VW; dry wt: 420#. Geared prop speed at .571. Cast aluminum cylinders set at 45°. B-90 1915 = 148hp@2275rpm to 166hp@2635rpm 423.2ci geared 8VW; dry wt: 460#. Geared prop speed at .571. 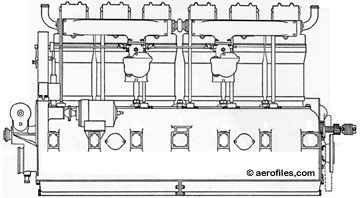 Cast iron cylinders set at 90°; propshaft mounted on two tapered roller bearings capable of end thrust in either direction. D-12 19?? = 150hp@1400rpm 898.32ci 12VW; dry wt: 750#. 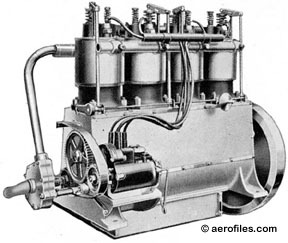 K-6 1915 = Geared model of the 90hp. 100hp@2000rpm 449.16ci 6LW; dry wt: 435#. Prop speed reduced by .571 gear ratio. L-6 1917 = 130hp@1625rpm to 215hp@3000rpm 553.25ci 6LW. L-6-D, L-6-G 1917 = "D" for Direct-drive; geared-drive was "G" suffix; dry wts: 400-500#. 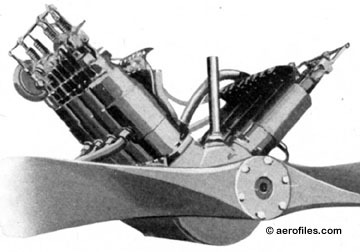 RAD 1930 (ATC 41) = 115hp 9RA. T-6 19?? = 200hp unknown type. U-6, U-8D 19?? = Later, improved versions of L-6 and L-8. (U-8D): 220hp@1800rpm 737.67ci 8VW. Aero Motors 1928: Beaver State Motor Co, Gresham OR. 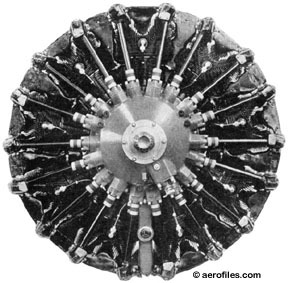 1929: Aero-Motors, Portland OR. 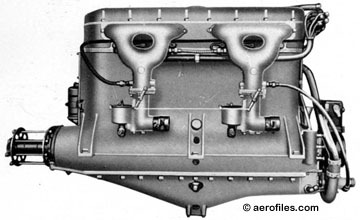 Aerobat 1929 = 150hp 326ci 8RA. Guy Thayer. Aeronautical Enginering Co, Oakland CA. 1929 = 300hp 542ci 2-cycle double-row 9RA. Aeronca Aeronca Aircraft Corp, Middletown OH. E-107, O-107 1930 = 30hp 106.9ci 2HOA. 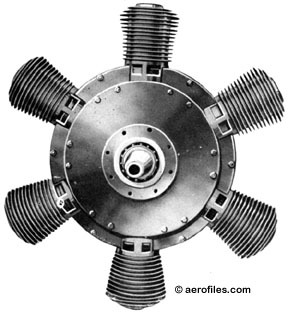 E-113A, O-113 1930 (ATC 71) = 36-45hp 113.5ci 2HOA. E-113C 19?? (ATC 189) = 40-45hp 113ci 2HOA. Aero Products Aeronautical Products Corp, Naugatuck CT.
Scorpion 1928 = 100hp 336ci 4LAI. Aircraft Aircraft Engine Co Inc, Oakland CA. 1911 = 80hp unknown type. Airex Airex Engineering Corp, Astoria NY. RX-2 19?? = 200hp 632ci 11RA. RX-10 19?? = 1000hp 2170ci 11RA. Albatross Albatross Co, Detroit MI. 1910 = 50hp@1230rpm 477ci 6RA; dry wt: 250#. Fred Weinberg. 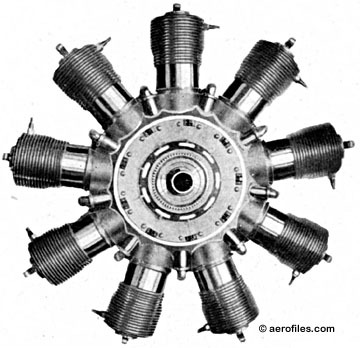 Generally accepted as the first fixed radial engine design in the US. c.1911 = 100hp@1230rpm 712.43ci 6RW; dry wt: 275#. Similar to the previous, but larger and water-cooled. Alexander Alexander Aircraft Co, Denver CO.
1928 = 5RA. W D Campbell. No production record found. 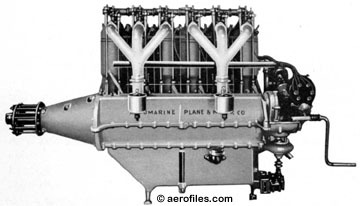 Alfaro Aircraft Engine & Development Co Inc, Boston MA. 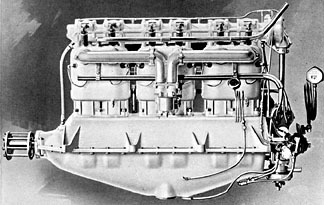 1938 = 155hp 167ci 4-cyl barrel engine. Heraclio Alfaro. Built by Indian Motorcycle Co (Hendee), Springfield MA. Allen Allen Aircraft Engine Co, Compton CA. 1928 = 200hp 673.4ci 8HOA; wt: 575#. Alliance-Hess Alliance Aircraft Corp, Alliance OH. Warrior c.1929 (ATC 24) = 115-125hp 7RA. Allied Allied Aviation Corp, Van Nuys CA. Monsoon 1939 (ATC 208) = 100hp 243ci 4LAI. License mfr of French Règnier 4-L.
Allison1915: (James A) Allison Engr Co, Indianapolis IN. 1926: Allison Engine Co. 1935: General Motors, Allison Div. 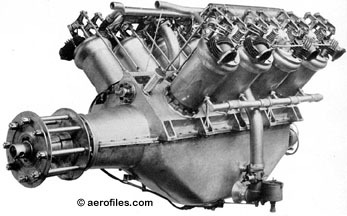 Began with auto racing engines, switched to contract construction of Liberty 12 for WW1, then refocused on aero engines. V-1410 1926 = 420hp 1410ci 12VAI. Air-cooled, inverted version of Liberty 12. 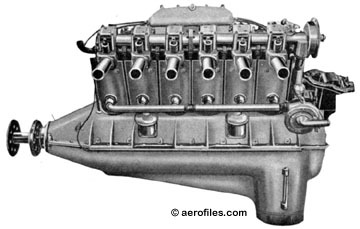 V-1650 1929 = 420hp 1650ci 12VWI. Liberty 12. 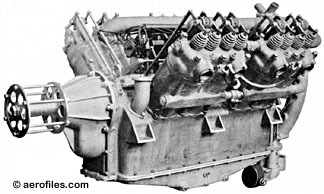 V-1710 1931 = 1040-1450hp 1710ci 12VWI. First delivery on 2/12/35 for dirigible USS Macon. 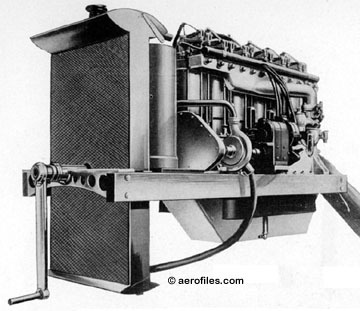 First aircraft engine specifically designed to use glycol as a coolant. 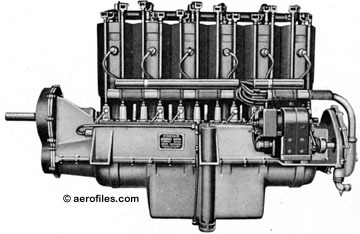 V-1710-A 1930 = 650hp 1710ci. POP: 1 built as a tester. V-1710-C8 1937 = 1000hp turbosupercharged production prototype, tested in a modified Curtiss P-36 (XP-37). Redesign: R M Hazen. POP: about 47,000. 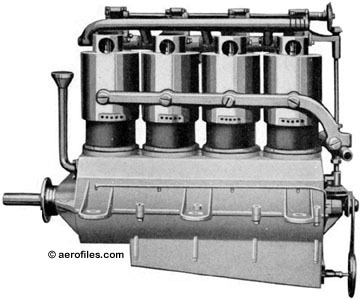 Production of piston engines ended in 1947. V-3420 aka W-3420 1939 = 2800hp supercharged double V-12 as 24VAI, ostensibly two V-1710s combined and with some common parts; wt: 3275#. Reportedly first flown in a B-29. POP: thousands ordered for Fisher P-75, but contract cancelled. POP: 1, built but never flew. X-4520 1928 = 1500hp 24X. American American Motor & Aviation Co, Denver CO and Long Beach CA. 1911 = 35hp 6RA rotary. S-5 19?? (ATC 181) = 100-125hp 441ci 5RA. AeroMotion (AMI) AeroMotion Inc, location unknown. Twin, O-100 1984 = 53-110hp 100.2ci 2HOA. Developed from Chevrolet V-8. Twin, O-101 1982 = ? ?hp 100.5ci 2HOA. Angle Glenn D Angle, Detroit MI. 1939 = 100hp 184ci 5RA. Arrow V-8 Arrow Aircraft & Motor Co, Lincoln NB. 1940: States Securities. F 19?? (ATC 151, 161) = 82hp 8VW. Ford conversion. Ashmusen (Henry W) Ashmusen Mfg Co, Providence RI. 1908 = 60hp 8HOA; dry wt: 235#. 1908 = 105hp@1800rpm 596.4ci 12HOA; dry wt: 345#. O-150 1912 = 25hp 149.6ci 4HOA. O-595 1917 = 105hp 596.4ci 12HOA. Atwood (Harry N) Atwood Aeronautic Co, Williamsport PA.
12-180 1915 = 120hp@2000rpm 150hp@2500rpm 190hp@3200 rpm 519.54ci geared 12HW; dry wt: 580#. POP: 1. M-1 1916 = 140hp 12VW. POP: 1. M-2 1916 = 350hp 12VW. POP: 1. Twin Six 1915 = No data. Axelson (J C) Axelson Machine Co, Los Angeles CA. 19?? (ATC 16) = 115hp 7RA. Axelson-Floco (J C) Axelson-(Leonard) Flo, Los Angeles CA. B 19?? = 150hp 612ci 7RA. C7R Bull's Eye 1927 = 140hp 7RA. Bakewell Shaw-Palmer-Bakewell Co, Los Angeles CA. Wingfoot 19?? = 165hp 452ci 4XA. Bat Airman Engineering Co (Noran Co), San Francisco CA. 1928 = 30hp 115ci 3RA. Barrett (Monty) Barrett Precision Engines Inc, Tulsa OK.
1985- Modified Lycoming engines for non-certificated airplanes. Bates (Carl S) Bates Aeroplane Co, Chicago IL. Bates Motorcraft Co, Chicago. 1912: Assets and right sold to Heath Aircraft. 8-B c.1914 = 110hp 8VW. Junior, O-120 19?? = 36-40hp 120.3ci 2HOA. O-77 1924 = 26hp 77ci 2HOA. -Harroun 1910 = 24hp 2HOA; wt: 95#. POP: 1 for (Roy) Harroun-Bates Blériot XI. Beatty George W Beatty, New York NY. 1914 = 40hp 4LW. Wright copy. 1915 = 60hp 301ci 4LW. 1914 = 80hp 481ci 8VW. Beecher (B L) Beecher Co, New Haven CT.
Beilgard Mechanical Research Laboratory, Hollywood CA. 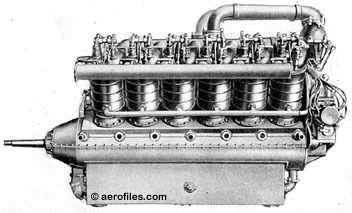 c.1938 = 9-cyl barrel engine, possibly the one reportedly fueled by butane. Blue Streak Blue Streak Motors Co, Wichita KS. 70 1929 = 70hp 3RA. 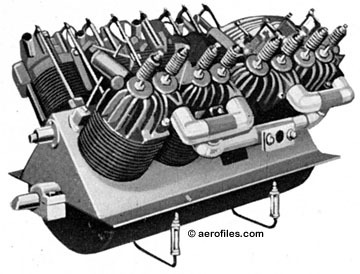 2-cycle, dual cylinders, U-shaped conn rods. 125 1929 = 125hp 5RA. Boland (Frank E) Boland Aeroplane & Motor Co, Rahway NJ; Newark NJ. 1911 = 60hp 402ci 8VW; dry wt: 240#. 1913 = 70hp 452ci 8VW; dry wt: 255#. 1913 = 100hp 700ci 8VW; dry wt: 325#. Boulevard Boulevard Engine Co, St Louis MO. Brooke Brooke-Kuhnert Co, Chicago IL. 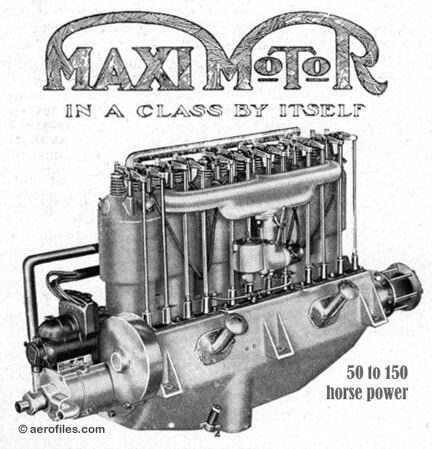 Multi-X c.1915 = 24hp 230.88ci 6RA rotary with two rows of 3 cylinders each. Non-Gyro 1911 = 85hp 602.9ci 10RA rotary. Two counter-rotating rotarys in tandem; would run on 5 cylinders. Brooks (Harold C) Brooks, Indianapolis IN. 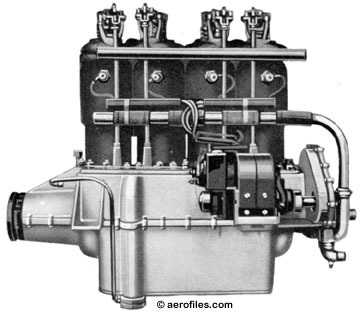 AF 1931 = 50hp 4LWI. Brott A Brott, Denver CO.
Brownback Brownback Motor Laboratories Inc, Pottstown PA. 1930: Light Mfg & Foundry Co.
C-400 (Tiger 100) 1930 (ATC 33) = 80-90hp 397ci 6RA. SEE Light. Tiger Kitten 19?? = 20hp 3RA. Licensed version of French Anzani. Burgess-White W Starling Burgess & Roland (>:Rollin) White, Marblehead MA (manufacture in Cleveland OH). X-16 1913 = 500hp 16XA. R White. Two V-8 motors united; possibly never completed. Call Aerial Navigation Co of America, Girard KS; fdr: Henry L Call. E-1, OL-295 1910 = 45-50hp 296.31ci (>296.9ci) 2HOW; dry wt: 135#. E-2, OL-595 1910 = 90-100hp 593.8ci 4HOW; dry wt: 225#. Cameron 1928: National Aero Corp, New York NY. 1946: (Everett S) Cameron Aero Engine Corp, Reading PA.
60 1928 = 60hp 4LAI. 100 1928 = 100hp 7RA. C4-I-E1 1946 = 125hp 301ci 4LAI. Caron Victor J Caron, Haverhill MA. O-155 1941 = 75hp 153.9ci 4HOA. Cato Joseph L Cato, San Francisco CA. 1912 = 60hp@1400rpm 349.88ci 4LW. There were also undocumented experiments with other motor designs in this pre-WW1 period, including a successful rotary that was used in his 1915 Cato-Bounds monoplane (qv). C-2, O-270 1919 = 72hp@1800rpm 272.3ci 2HOA; dry wt: 154#. O-125 1910 = 35hp@1500rpm 125.66ci 2HOA; dry wt: 146#. Chamberlin Rover 1939: Clarence D Chamberlin, Jersey City NJ, on acquisition of Rover rights from Jean Roché. L-496 1939 (ATC 37) = 100-110hp 6LAI. Remanufacture of Michigan Rover. Chevrolair (Arthur) Chevrolet Aircraft Corp, Indianapolis IN. D-4 1929 (ATC 35) = 90-120hp 352ci 4LAI. D-6 1929 (ATC 56) = 165-180hp 529ci 6LAI. Chevrolet (Louis) Chevrolet Aircraft Corp, Baltimore MD (in Martin Co plant). 333 1929 (ATC 59) = 120hp 4LAI. Continuation of Martin 333.
c.1912 = Radial, no data. Christofferson Christofferson Bros, Oakland CA..
1915 = 120hp@1400hp 637.98ci 6LW. Reportedly a 12-cyl 240hp version was built some time later. Chrysler (Walter) Chrysler Motors Inc,. IV-2220, XI-2220 1941 = 2500hp 1387.5ci 16VWI. Two V-8s coupled back-to-back with mid-drive. POP: 1 in 1945 for flight tests in XP-47H, redesignated from P-47D, which attained a speed of 490 mph, then the project was cancelled. This was technically the first of the famed Chrysler hemi engines. Church James Church, Chicago IL. 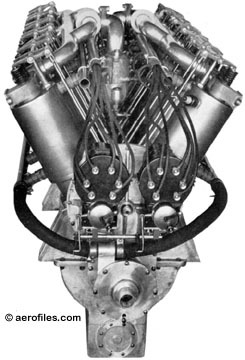 J-3 Marathon 1929 = 41-46hp 3LA. Converted Henderson motorcycle engine. V-8 B 19?? (ATC 224) = 93hp 248ci 8VA. Cleone 1929: Cleone Motors Co, St Louis MO. 1929 = 25hp 2HOA. SEE Cyclomotor. Cleveland Cleveland Aero Motor Co, Cleveland OH. 4 1917 = 150hp 706.86ci 6RA. Walter C Willard. 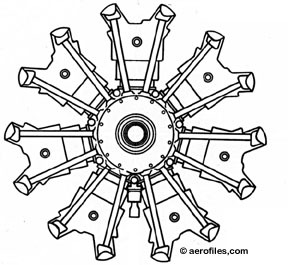 Unique concept of each piston operating a bevel gear, which in turn meshed with a main gear to drive the propshaft. Also reportedly produced as 140hp. Comet Comet Engine Corp, Madison WI. 7-D 1928 (ATC 9) = 150hp 612ci 7RA. 7-E 1929 (ATC 47) = 165hp 612ci 7RA. 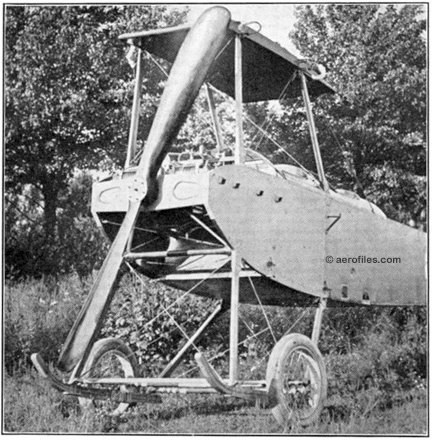 7-RA 1928 (ATC 9) = 130hp 7RA. Continental 1928: Continental Motors Corp, Aircraft Engine Div, Muskegon MI. Continental c.1923: Aviation & Engr Corp, Detroit MI. 19?? : Continental Aircraft Engine Co. 19?? : Teledyne Continental. A-40, O-110 1931 (ATC 72, 174) = 37-40hp 111.2ci 4HOA. 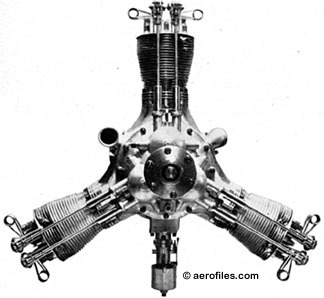 Credited as the simplest aviation production piston engine ever built. A-50, O-170 1938 = 50hp 171ci 4HOA. A-65-8F, O-170 1939 (ATC 205) = 65hp 171ci 4HOA. A-70 1928 (ATC 32) = 165-170hp 544ci 7RA. A-75, O-170 193? = 75hp 171ci 4HOA. A-80, O-170 193? (ATC 217) = 80hp 171ci 4HOA. A-90 19?? = 90hp 4HOA. A-100, O-255 1945 (>1941) (ATC E-241) = 100hp 256.5ci 6HOA. Two versions: one developed from a C-145 (-125?) 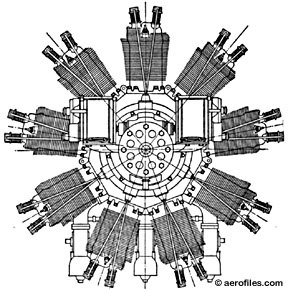 case and crankshaft as 6HOA, and the other as a radial. Info needed. C-40 19?? = 40hp 4HOA. C-50 19?? = 50hp 4HOA. C-65 19?? = 65hp 4HOA. 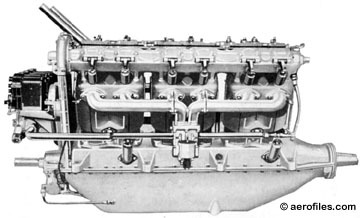 C-75, O-190 1945 = 75hp 188ci 4HOA. C-85, O-190 1946 (ATC 233) = 85hp 188ci 4HOA; wt: 170#. C-85-8 = A-65 but 188ci; tapered propshaft, wt: 188#. 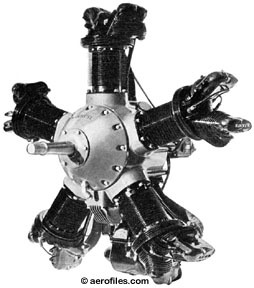 C-85-8F = C-85-8 with flanged propshaft. C-85-12 = C-85-8 with starter. 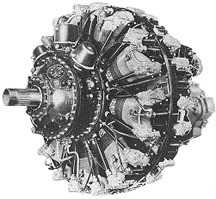 C-85-12F = C-85-12 with flanged propshaft. 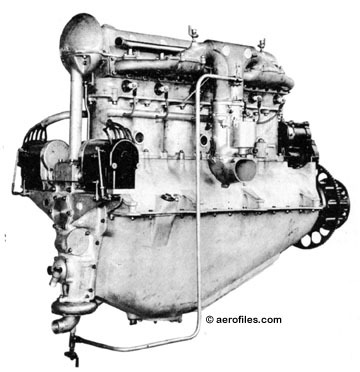 C-90, O-200 1947 (ATC 252) = 90-95hp 201ci 4HOA. C-90-8F = O-200-A but wt: 184#. C-90-12F = C-90-8F with starter. C-90-12FH = C-90-12F with manual hydraulic prop. 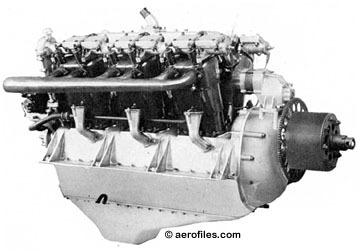 C-115, O-280 1945 = 115hp 281.9ci 6HOA. C-125, O-280 19?? = 125hp 281.9ci 6HOA. C-140, O-280 19?? = 145hp 281.9ci (>301.4ci) 6HOA. C-145, O-300 1947 = 145-175hp 301.4ci 6HOA. E-165, O-470 1947 = 165hp 471.1ci 6HOA. 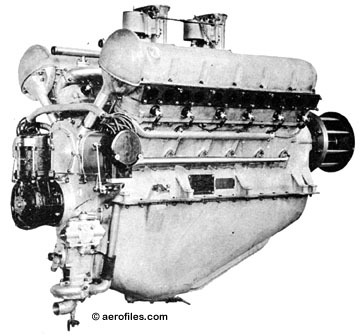 E-185, O-470 1947 = 185-205hp 471.2ci 6HOA. E-225-8, O-470 = Military 225hp GIO-470-A with direct-drive turbocharger; 80/87 fuel. FSO-526-A 19?? 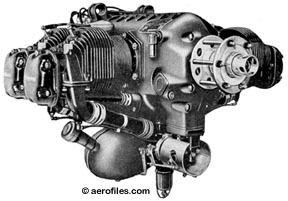 (ATC 292) = Helicopter engine. 270hp 526ci 6HOA; 6:1 geared supercharger; wt: 575#. O-170 1941 = Military version of A-65. O-200-A 19?? (ATC 252) = 100hp 201ci 4HOA; dry wt: 190#. TSIO-200 = 145hp O-200A; turbocharger, electrical system; wt: 239#. O-240 1971 = 125-130hp 239.7ci 4HOA. O-300-A 19?? (ATC 253) = 145hp 301ci 6HOA; straight starter drive; wt: 267#. O-300-B = O-300-A with manual hydraulic prop. 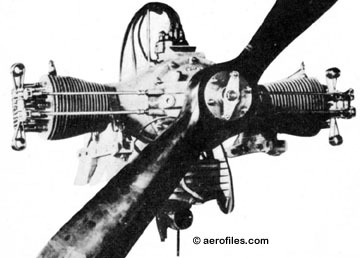 O-300-C = O-300-A with modified ARP-502 propshaft. O-300-D = O-300-A with starter, shielded ignition. GO-300-A 19?? (ATC 298) = 175hp 301ci 6HOA; straight starter drive: wt: 309#. GO-300-B = GO-300-A with governed hydraulic prop. GO-300-C = GO-300-A with short oil filler neck and breather tube. GO-300-D = GO-300-A with starter, electrical system, shielded ignition. GO-300-E = GO-300-D with governed hydraulic prop. O-315 1952 = 150-175hp 314.2ci 4HOA. O-346, IO-346 1962 (TC E3CE) = 165hp 346.4ci 4HOA; fuel injection; wt: 270#. O-360, IO-360-A 1962 (TC E1CE) = 210hp 360ci 6HOA; fuel injection; wt: 294#. O-360-B = 180hp IO-360-A with lower compression; wt: 334#. O-368 1979 = 180hp 368ci 4HOA. O-470-G, -P 19?? (ATC 273) = 240hp 471ci 8:1 432# 6HOA; updraft carb, cast oil sump. From E-165/-185. OO-470-H = O-470-M with extended propshaft; 455#. OO-470-J = 225hp O-47-K 380#; revised cylinder heads; 80/87 fuel. 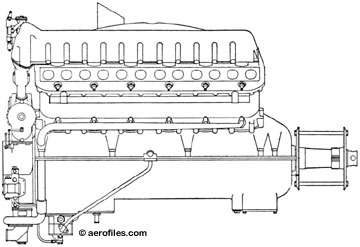 O-470-K = 230hp O-470-G 7:1 404#; updraft carb, sheet metal oil sump, 80/87 fuel. 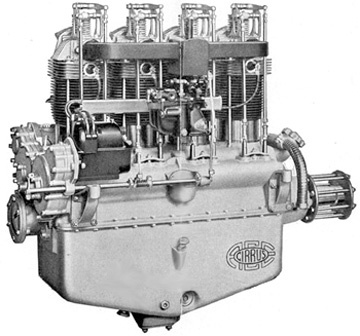 O-470-L, -R = O-470-K with carb relocation. O-470-N = O-470-M with new crankshaft. IO-470-C 19?? (TC 3E1) = 250hp 471ci 6HOA; geared 8:1, fuel injection. wt:426# , 91/96 fuel. O-470-D = 260hp; geared 8.6:1, 100/130 fuel. O-470-E, -F, -L, -M, -S = 100/130 fuel. O-470-G, -R = 250hp IO-470-E with short spark plugs. 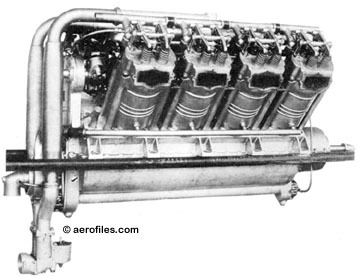 O-470-H, -N = IO-470-C with -470-D cylinders, pistons, bearings; 100/130 fuel. O-470-J, -K = IO-470-C but 225hp; geared 7:1. Slick mags, 80/87 fuel. 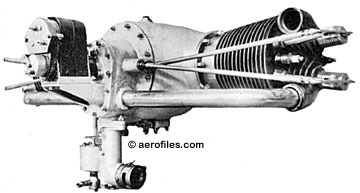 O-470-P = IO-470-G with extended propshaft. GIO-470-A 19?? (TC E2CE) = 310hp 6HOA; fuel injection, 100/130 fuel. TSIO-470-B 19?? (TC 3E3) = 260hp 471ci 6HOA; geared 7.5:1, turbocharger, fuel injection; wt: 467#. TSIO-470-C, -D = TSIO-470-A for various applications. O-520, IO-520 1963 (TC E5CE) = 250-325hp 519.5ci 6HOA. TSIO-520 19?? = 285-325hp 6HOA. GTSIO-520 19?? = 340-435hp 6HOA. O-526, FSO-526 1957 = 260-340hp 526ci 6HOA. 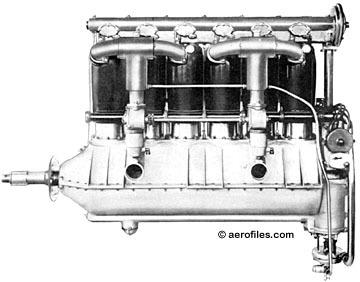 OL-1430, V-/IV-1430 1938 = Began as a McCook Field test in 1929, a 1008ci 12VW as V-1430 with "Hyper" cylinders of hemispherical piston tops and cylinder heads, and sodium-cooled exhaust valves. Harold Morehouse et al. POP: 23. In 1934 the Army wanted it enlarged to 1425ci and handed the project to Continental, who redesigned it as flat opposed O-1430 (1426ci 12HOA). A 1000hp inverted prototype was tested in 1938, but a decision was made in 1939 to revert to a 12VWI, supercharged as 1600hp IV-1430 (later aka XI-1430), around which the Lockheed XP-49 and McDonnell XP-67 were designed. However, when it became clear the war would be over before any production could be expected, the 15-year-old project was scrapped in 1944, even though a test that year gave a remarkable 2100hp @ 3400rpm and 87.7". R-9A 19?? = Wright R-975, possiby license-built. R-670 1931? (ATC 80, 120) = 210/225hp 668ci 7RA. Originally a tank engine developing 235-250hp @ 2400rpm. Tiara 4-180, O-270 1970 = 180hp 270.6ci 6HOA. Tiara 6-260, O-405 1965 = 260-300hp 406ci 6HOA. Tiara 6-285, O-405 1969 = 285hp 406ci 6HOA. POP: 46; production stopped c.1972. Tiara 6-320, O-405 1969 -260-300hp 406ci 6HOA. Tiara 8-380, Tiara 8-450, O-540 1970 -380-450hp 541.3ci 6HOA. 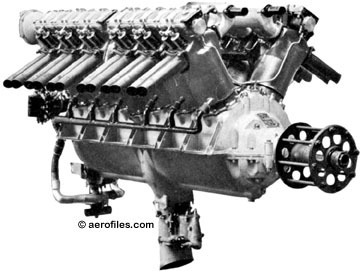 V-1650 1942 = Wartime contract production of Rolls-Royce Merlin V-1650-3, -7, -9, and -17. POP: 897. W-670 1934 (ATC 168) = 210-240hp 668ci 7RA. Derived from A-70. -Honda, OL-370 (Japan) 2002 = 225hp 370.6ci 4HOA. Crosley Crosley Aircraft Co, Cincinnati/Sharonville, OH. 113, O-113 1929 = 40hp 113.5ci 2HOA. Crouch-Bolas C-B Aircraft Co, Pawtucket RI. Dragon Type IVD 1932 = 65hp 214ci 4LAI; wt: 195#. Direct Drive. Dragon Type IVG 1932 = 90hp 214ci 4LAI; wt: 245#. Geared Drive. Curtiss (Glenn H) Curtiss Aeroplane & Motor Co, Hammondsport and Buffalo NY. c.1917: Curtiss Engineering Corp, Garden City NY. 19?? : Curtiss Aeroplane & Motor Corp.
1909 = 25-30hp 177ci 4LW. 1909 = 37-45hp 504ci 8VW. A-2 1904 = 7hp@1500rpm 60.14ci 2LW; dry wt: 50#. Built for T S Baldwin's dirigible; ff: 8/3/04. A-4 19?? = 15hp@1800rpm 107.84ci 4LA; dry wt: 90#. A-8 19?? = 30hp@1800rpm 215.68ci 8VA; dry wt: 140#. 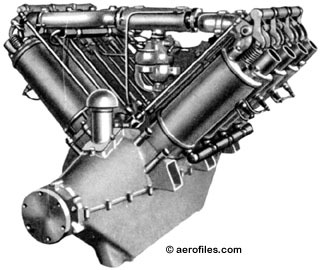 AB 1917 = Conceptual 12-cyl experimental engine as low-drag, low-weight power for fighter planes. POP: 1; project shelved, but acquired technology went into development of Curtiss-Kirkham K-12. B-8 1907 = 40hp@1800rpm 268.32ci 8VA; dry wt: 150#. Built during Curtiss' AEA involvement with Alexander G Bell. 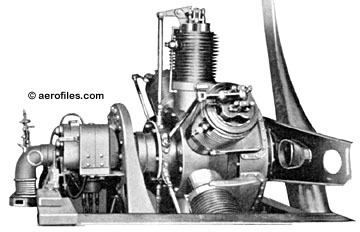 The first Curtiss engine to sustain a heavier-than-air craft in flight, also thought to be first to lift a helicopter. C-1 1904(?) 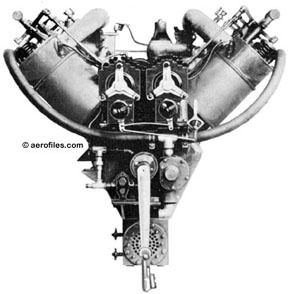 = The first Curtiss engine. 3hp@1800rpm 26.96ci; dry wt: 40#. Single-cyl, air-cooled; bore and stroke both 3.25"; height: 17" length: 10" width: 3.125". C-4 19?? = 25hp@1800rpm 165.12ci 4LA; dry wt: 110#. C-6 1922 (Group 2) = 161hp@1750rpm 572.54ci 6LW; dry wt: 448#. K-6 redesigned by Arthur Nutt. C-12 1919 = Redesigned K-12. 427hp@2250rpm 6LW; dry wt: 705#. 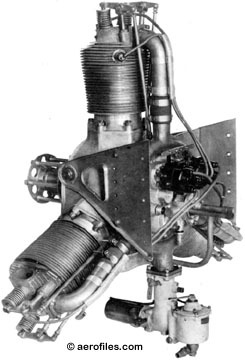 CD-12 c.1920 = C-12 with direct-drive prop. 325hp@1800rpm; dry wt: 680#. Crusader 19?? = 120hp 6-cyl unknown type. Curtiss-Rolls? "Strange thing, isn't it, that the USA has never recognized Glenn Curtiss as by far the greatest man America has ever produced in Aviation? ... And the D-12 engines, from which the Rolls Falcon, and ultimately the Merlin, are descended ... So far as I know, there is nobody in the world who has claim to have influenced aircraft design and production as he did or had done ..." Charles Grey, founder and editor of The Aeroplane 1911-1939; editor of Jane's All The World's Aircraft 1916-1941, and an Englishman (c.1950). D-12, -12A 1922 (ATC 10) = 400hp@2000rpm 1145ci 12VW; dry wt: 660#. C-W K-12 redesigned by Arthur Nutt. E-4 19?? = 50hp@1500rpm 392.7ci 4LA; dry wt: 250#. 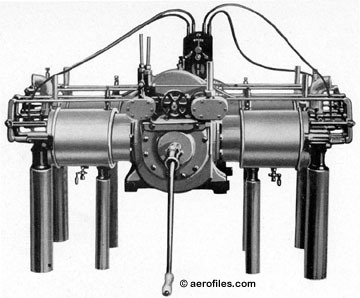 First water-cooled Curtiss engine. E-8 1909 = 100hp@1500rpm 785.4ci 4VW; dry wt: 350#. Double-row version of E-4. Awarded top prize at 1909 Rheims air meet. H, K 19?? = 40hp@1500rpm 251.32ci 4LW; dry wt: 175#. H-1640 Chieftain 1926 (ATC 8) = 600hp 1640ci 12RA (twin-row hexagonal). Developed as competition for P&W Wasp, but was unsuccessful, suffering cooling problems for its rear cylinders. K-6 1917 (Group 2) = 150hp@1700rpm 572.54ci 6LW; dry wt: 417#. Charles Kirkham. Direct-drive, short version of K-12; became C-6. L 1911 = 80hp@1500rpm 502.64ci 8VW; dry wt: 285#. Winner at Rheims, France, competitions in 1903. O 1912 = Improved Model L, refined again as the legendary OX line. 75hp@1100rpm 8VW. Why OX-5? 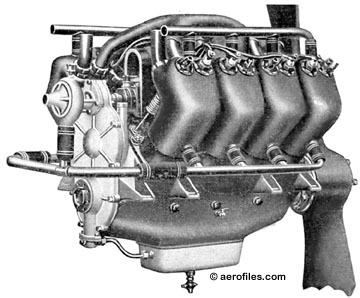 Curtiss wanted to publicize his improved version O-model engine by naming it the O+. However, one of his cohorts insisted that neither "O+" nor "O-Plus" looked good in print, and suggested the "plus" sign be rotated 45° instead so as not to be mistaken for a "T." Curtiss agreed and his new model then became the "OX-2" or, among his workers, the "Oh-by-two." OX-2 1913 = 85-90hp@1200rpm 502.64ci 8VW; dry wt: 390#. Bosch magneto, Schebler carburetor. OX-5 1917 (Group 2) = 90hp 502.64ci 8VW; dry wt: 390#. Almost identical with OX-2 but Berlin magneto and Zenith carburetor. The first mass-produced aircraft engine in the USA. OXX-2, -3 1916 = 100hp 567.44ci 8VW; dry wt: 401#. Except for a bigger bore, almost identical to OX. OXX-5 1917 = 75hp 567.44ci 8VW. OXX-6 19?? 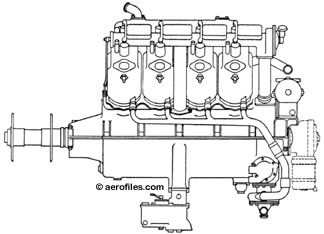 (Group 2) = 102hp 567.44ci 8VW. S 1912 = 60hp@1600rpm 376.98ci 6LW; dry wt: 245#. V-2, -3 1914 = 180-200hp@1400rpm 1009.56ci 8VW; dry wt: 690#. Charles Manly. 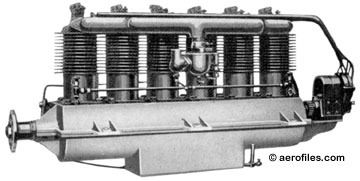 The first Curtiss V-8. Russia bought several V-3s, but never received them. Their freighter was sunk on the way by a German U-boat. V-4 c.1911 = 40-60hp 1649.34ci 4VW; dry wt: 1,086#. V-8 1912 = 75-80hp 8VW. Same as the O/OX series. V-1400 1925 = 620hp 12VW. POP: 12, of which 3 used in Curtiss racers. 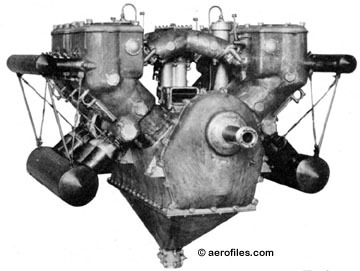 V-1550 1926 (ATC 6) = 575-600hp 12VW. Enlarged D-12. V-1570, GV-1570 Conqueror 1929 (ATC 7) = 575-650hp 1569ci 12VW. Developed from V-1550 by Arthur Nutt. V-1570-A Conqueror 1931 = 700hp 1569ci 12VW. V-1570 Super Conqueror 1933 = Geared and supercharged; 800hp 1569ci 12VW. VX 1916 = Model V with some minor changes. 180hp@1400rpm . Curtiss-Kirkham (Charles B) Kirkham Aeroplane & Motor Co, Savona NY. K-12 1917 = 397hp@2250rpm 1145ci 12VW. Charles B Kirkham. Evolved into Curtiss C-12. The Curtiss triplane specifically designed around this engine captured both a world altitude record for a non-supercharged plane and a world speed record (p: Roland Rohlfs). Cyclomotor Cycloplane Co Ltd, Los Angeles CA; fdrs: H S Myrhes, Omer L Woodson..
1931 = 22hp 72ci 2HOA. Dawn Dawn Aircraft Motors Inc, Los Angeles CA. Duplex 1929 = 5RA. 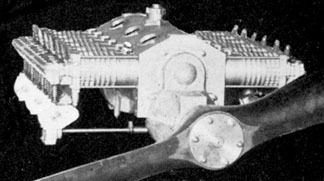 Lee Bowman, as a copy of French Gobron-Brille with two pistons in each cylinder head. Day Charles H Day, Los Angeles CA. 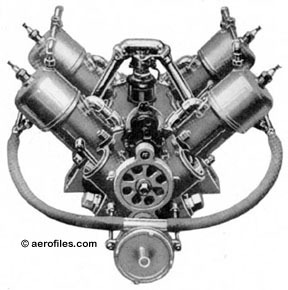 1909 = 25hp 5-cyl air-cooled engine used on his plane by Day at the Dominguez Hills air meet. Dayton 1927: Dayton Airplane Engine Co, Dayton OH; 1930: Pawtucket RI. Bear 1928 (ATC 11) = 100-120hp 444ci 4LA. Modified Hall-Scott A-7. -Grant, O-765 1929 = 225hp@2000rpm 763.4ci 8HOA; wt: 500#. POP: 1. Detroit Detroit Aeroplane Co, 74 Crane Ave, Detroit MI; Detroit Mfrs Syndicate. 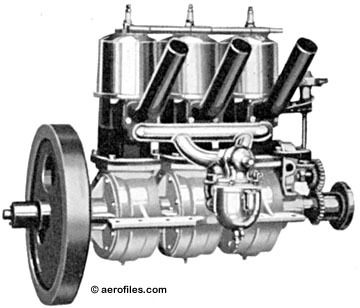 Aero, O-240 1910 = 20-30hp@1500rpm 237.48ci 2HOA. Fred Weinberg. 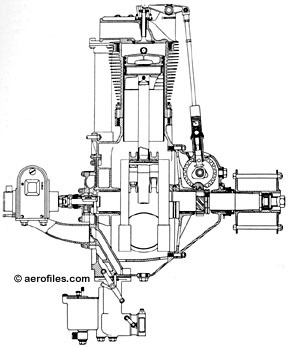 Aeromotor 1910 = 30-50hp 4LW. 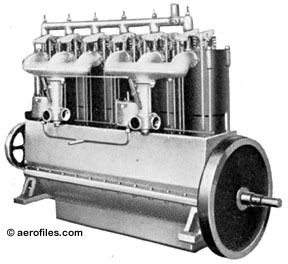 Aeromotor 1910 = 60-75hp 6LW. Viking 1919 = 140hp 16XA. Detroit, Detroit-Rickenbacker c.1918: Detroit Aeronautic Construction Co, 74 Crane Ave, Detroit MI. c.1920: Detroit Aircraft Engineering Corp (Glenn D Angle & Edward V Rickenbacker). 1928: Sold to LeBlond Co, Cincinnati. 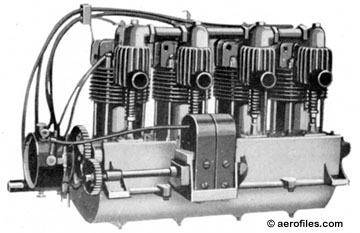 c.1920 = 30-75hp 4LW and 6LW. 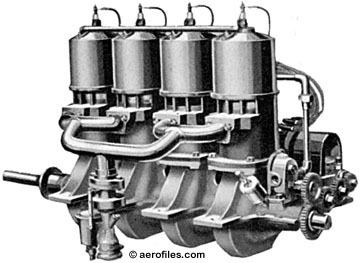 Air Cat 1925 = 60-85hp 234ci 5RA. Doble-Besler Doble Steam Car Co & Boeing School of Aeronautics, Oakland CA. V-2 1933 = A converted switch-locomotive powerplant; d: Nathan C Price. Two-cylinder steam power fitted with a 150hp reciprocating engine designed by William Besler; total 650# with its accessories, liquids, and fuel oil-heated boiler. Mounted in a Travel Air 2000 for successful flights, one feature was relative silencespectators on the ground could hear the pilot Besler when he called to them when flying overhead. SEE Besler entry on Aircraft pages. Dodge Dodge Tool Co, Grinnell IA. Victory 1918 = 125hp 706.86ci 6RA; dry wt: 394#. Bearcat 19?? = 70hp (modified Ford A?). 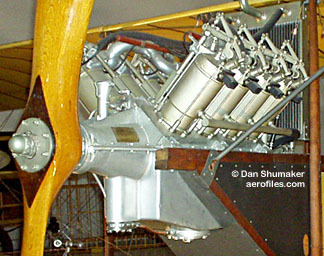 1909 = 40hp 4-cyl water-cooled engine used in his plane by Douseler at the Dominguez Hills air meet. Duryea-Turnbull (Charles E) Duryea Power Co, Reading PA..
OL-185 1905 = 16hp 184.8ci 2HOA; wt: 120#. Built for Canadian pioneer aviator W Rupert Turnbull. Earl (Harry W) Earl Aviation Corp, Portland OR. Eggenfellner (Jan) Eggenfellner Aircraft LLC, Edgewter FL. 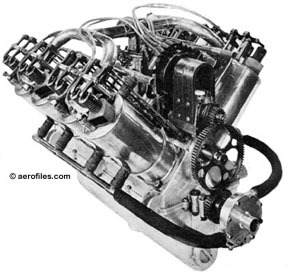 1993 = Conversion of 4HOA and 8HOA Subaru auto engines for non-certificated airplanes. Elbridge Elbridge Engine Co, Rochester NY. A 1908 = 6-10hp 77.32ci 2LW; dry wt: 88#. 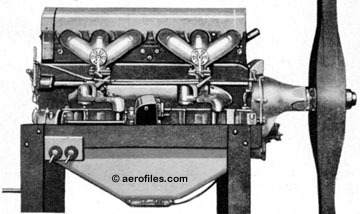 Aero Special 1910 = 60hp 6LW. 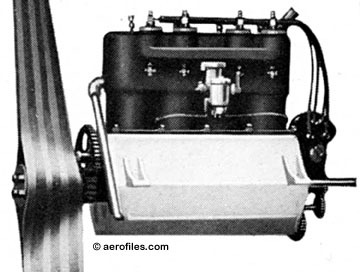 Aero Special 1911 = 40hp 4LW. Valveless two-cycle. 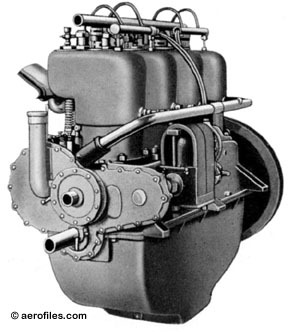 B 1909 = 4-cyl experimental engine sold to a Dr Green. No data. C 1909 = 18hp 226.8ci 3-cyl unknown form; dry wt: 235#. Featherweight 3 1910 = 30-45hp@1400rpm 226.8ci 3LW; dry wt: 150#. Featherweight 4 1910 = 40-60hp@1400rpm 302.4ci 4LW; dry wt: 200#. Featherweight 6 1910 = 60-90hp 453.6ci 6LW; dry wt: 250#. Emerson Emerson Engine Co, Alexandria VA.
4 1911 = 60hp 4LW. 6 1911 = 100hp 6LW; dry wt: 300#. 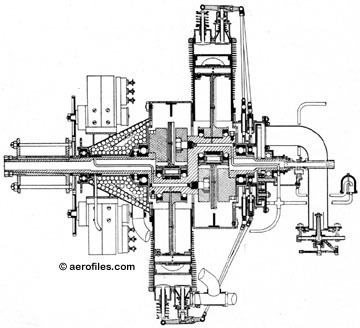 Aerial 1910 = 120-150hp 6LW. Endicott J L Endicott Airplane Co, Medford, Long Island NY. 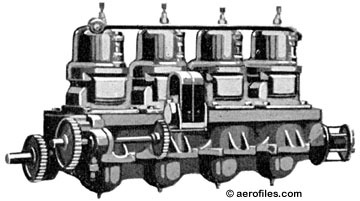 1910 = 60hp 3-cyl two-cycle engine for use in their produced airplanes. W-1 1920 = 700hp@1700rpm to 750hp@1800rpm 2778.66ci 12VW; dry wt: 1,725#. W-2 1921 = 1000hp@1400rpm 4479.66ci 18VW; dry wt: 2,400#. Excelsior No data. SEE ALSO Lawrance. 447-B 1927 = 150hp 447ci 4RA. David Caminez. 447-C 1928 (ATC 1) = 120hp 447ci 4RA. Floco Frank L Odenbreit Co Inc, Los Angeles CA. A-7-R 1927 = 150hp 612ci 7RA. Ford Ford Motor Co, Detroit MI. O-145 1927 = 36hp 143.1ci 4HOA; wt: 118#. Only recorded use for flight was in the Ford Flivver lightplanes. 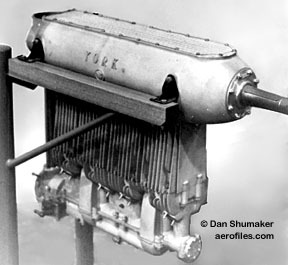 Curiously, Henry Ford never pursued the idea of offering an aviation engine, although his models T and A auto motors were quite popular among home-builders in the '20s. Fox Dean Mfg Co, Newport KY.
Aero Motor 1911-1912 = 36-200hp various 3/4/6/8LW. Franklin 1936: Doman-Marks Engine Co Inc, Syracuse NY. 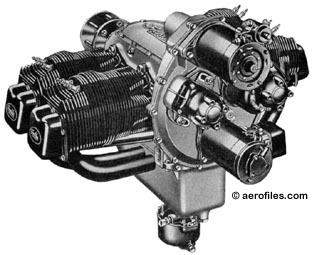 1937: Aircooled Motors Div, Franklin Engine Co. c.1942: F W Woolworth Co. c.1945: Republic Aviation. 1961: Allied Aero Industries, Pottstown PA. 19?? : Franklin Engine Corp (p: Nathan Abbott). 1975: PZL-Franklin, Rzeszow Poland. 2A-120, O-120 1964 = 60hp 117.6ci 4HOA. 2A4, 2A-110, 2AL, O-110 1945 (ATC 240) = 49-60hp 111.3ci 2HOA. 4A-235, Sport 4, O-235 1964 = 116-130hp 235.2ci 4HOA. 4A4 1938 (ATC 239) = 75-100hp 4HOA. 4A4-75. -85, -95, -100, 4A-225, O-225 1945 = 75-125hp 222.7ci 4HOA. 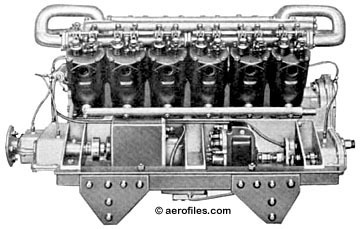 4AC-171, O-170 1939 = 60hp 171ci 4HOA. 4AC-176, O-175 1940 = 65-94hp 175.9ci 4HOA. 4AC-199, O-200 1941 = 80-113hp 198.6ci 4HOA. 4AC-150, O-150 1938 (ATC 194, 206, 221, 226) = 50-65hp 149.6ci 4HOA. Carl T Doman. 6A-350, 6V-350, O-350 1964 = 200-235hp 352.8ci 6HOA. 6A4-124, -130, -135, -140, -145, 150, -165, -178, -1854, -200, -300, O-335 1945 = 125-240hp 334ci 6HOA. 6A8-215, O-500 1945 = 215hp 500.7ci 6HOA. 6AC 19?? (ATC 222, 225) = 110-130hp 6HOA. 6AC-264, O-265 1940 = 117-138hp 263.9ci 6HOA. 6AC-298, 6ACV-298, O-300 1941 = 130-160hp 297.9ci 6HOA. 6AC-403, 6ACV-403, O-405 1942 = 215-245hp 403.2ci 6HOA. 6ACV-405 1944 = 6HOA. Vertical fan-cooled helicopter engine. 6AL-315, O-315 1945 (ATC 234) = 175hp 315.7ci 6HOA. 6V4, O-335 same as 6A4 data. 6V6-245, 6V6-300, O-425 1944 = 240hp 425.3ci 6HOA. 8ACGSA-538, O-540 1942 = 300hp 537.6ci 8HOA. 8AC-398, O-400 1941 = 200-235hp 397.2ci 8HOA. 12AC-806, O-805 1942 = 450hp 806.4ci 12HOA. O-200 (TC 4AC) 19?? = 115hp 4HOA. O-425 19?? = 245hp unknown type (was R-680?). R-680 19?? = 245hp HOA. Frederickson World's Motor Co, Bloomington and Chicago IL. 5A 1916 = 70hp@1000rpm 377.7ci 5RA 2-cycle rotary; Walter Brock. POP: 1. 10A 1916 = 140-150hp 755.4ci 10RA 2-cycle rotary. Frontier Frontier Iron Works, Buffalo NY. A-1 1912 = 35hp 253.92ci 4LW; dry wt: 175#. 1911 ad describes A-1 as 60 to 70hp 8 cyl. A-2 1912 = 55hp 507.84ci 8VW; dry wt: (cast iron cyl jackets) 315# (copper cyl jackets) 292#. Funk Akron Aircraft Co Inc, Akron OH. E 1938 (ATC 201) = 63hp 4LIW. Modified Ford B auto engine. Gallaudet (Edson) Gallaudet Engr Co Inc, Norwich CT.
General General Aeronautic Co, 110-112 W 40 St, New York NY. 1916 = 12-cyl "semi air-cooled." No data..
General Moore General Airmotors, Scranton PA.
1929 (ATC 36) = 120hp 5RA. General Ordnance General Ordnance Co, Derby CT. 19?? = 200hp 921.52ci 8VW; dry wt: 876#. POP: 1. Gryphon Aircraft Engineering & Accessory Development Co, Jenkintown PA.
M 1932 = 150p 511ci 8HOA. N 1932 = 225hp 811ci 12HOW. Guiberson (S Allen) Guiberson Diesel Engine Co, Dallas TX. A-980 1932 (ATC 79) = 185hp 9RA diesel. Fred A Thaheld. A-918 1934 = 250hp 9RA diesel. C C Spangenberger. POP: 4. 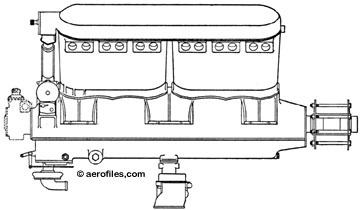 A-1020 1939 (ATC 220) = 310hp 1021ci 9RA diesel. A T-1020 version was coincidentally produced for use in tanks. To demonstrate its capability to military and civil aviation officials in 1940, a 1500-mile flight from Dallas to Washington DC took 10h:35m flying time at an average 142mph. Cruising at 3000' altitude at 1800rpm on Caterpillar tractor fuel (6 cents a gallon) consumed at the rate of 11.5 gph, cost was only $6.90. Three gallons of lubricating oil added $4.20a total of $11.10 for fuel and oil for the flight. Its fuel cost of less than 12 cents a mile was an unheard-of figure for flight operations at the time! Gyro Gyro Motor Co (fdr: Emile Berliner), 774 Girard St, Washington DC. 1911 = 22hp 3RA rotary. Fred Weinberg. 1911 = 35hp 5RA rotary. Fred Weinberg. Duplex J 1914 = 50hp@1250rpm 477.12ci 5RA rotary; dry wt: 170#. Duplex K 1914 = 90hp@1250rpm 667.97ci 7RA rotary; dry wt: 215#. Duplex L 1914 = 110hp@1200rpm 858.82ci 9RA rotary; dry wt: 270#. M-2 19?? = 25hp unknown type. Hall Harold Hall, no location. 1928 = 300hp 884ci 6LW. POP: 1, installed in a Fokker D.7 for testing. Hall-Scott 1911: (Albert John) Hall-(Bert) Scott Motor Car Co, Berkeley and San Francisco CA. 1910 = 60hp unknown type. A-1 1910 = 32-40hp@1500rpm 251.32ci 4LW; dry wt: 165#. A-2 1911 = 60hp@1400rpm 402.08ci 8VW; dry wt: 260#. A-3 1912 = 80hp@1400rpm 502.64ci 8VW; dry wt: 290#. A-4 1912 = 100hp@1200rpm to 120hp@1500rpm 785.4ci 8VW; dry wt: 535#. A-5 1915 = 125hp@1250rpm 824.67ci 6LW; dry wt: 525#. A-5a 1915 = 165hp@1475rpm 909.22ci 6LW. A-7 1916 = 90-100hp@1400rpm 549.78ci 4LW; dry wt: 410#. A-7a 1916 = 100hp@1400rpm 606.14ci 4LW; dry wt: 420#. A-8 1917 = 450-500hp 1649.34ci 12VW; dry wt: 1,000#. L-4 1919 (Group 2) = 125-130hp@1675rpm 549.78ci 4LW; dry wt: 380#. Used Liberty cylinders and valve gear. L-6 aka Liberty 6 1919 = 224hp@1700rpm to 244hp@1830rpm 825.67ci 6LW; dry wt: 546#. Hallett Hallett Aero Motors Corp, Inglewood CA. H-526 1928 = 130hp 526ci 7RA. Vee c.1920 = 8VW. 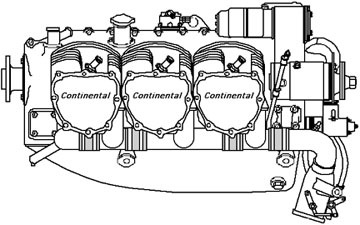 Valves in cylinder heads with superimposed camshaft and operating mechanism. Hamiltonian Charles K Hamilton, Mineola NY. -Christie c.1910 = 110hp 8VW. Likely a Curtiss motor modified by Hamilton. Hansen & Snow (W G) Hansen & (Leland L) Snow, Pasadena CA. 1910 = 35hp@1200rpm 226.2ci 4LW; dry wt (minus flywheel): 105#. Harriman (Frank H) Harriman Motor Works, S Glastonbury CT.
1910 = 60hp@1350rpm 392.7ci 4LW; dry wt: 240#. c.1915 = 100hp@1400rpm 589.05ci 6LW; dry wt: 355#. Harris Arnold Harris, Towanda FL. B-1 19?? 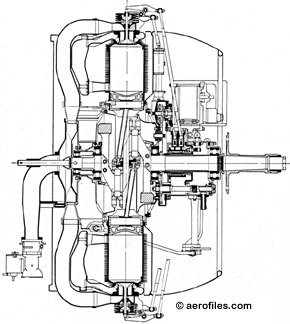 (ATC 22) = 90-112hp 8VW. Hartland Hartland Engine & Machine co, Hartland WI. 1928 = 125hp 7RA. Nick Rowinski. Heath (Edward B) Heath Aircraft Corp, Chicago IL. 19?? : International Aircraft Corp, Niles MI. 1909 = 25hp 2-cyl ?. 4-B 1918 = 75hp 4LW. 4-C 1918 = 40-60hp 4LW. 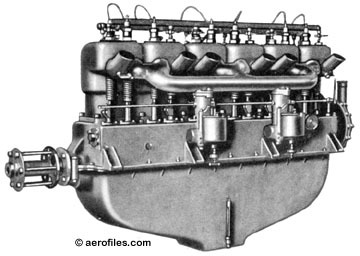 B-4 c.1926 = 25hp 83ci 4LA. Modified Henderson motorcycle engine. B-12 19?? = 200hp 12VW. 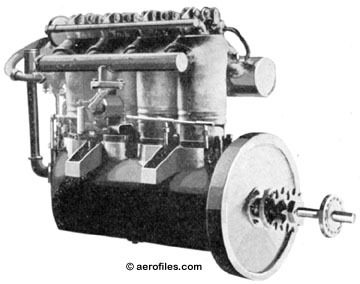 C-2 c.1919 = 25hp 2HOA. 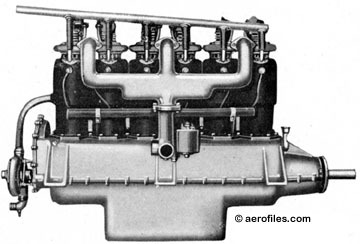 C-3 c.1919 = 40hp 3RA. 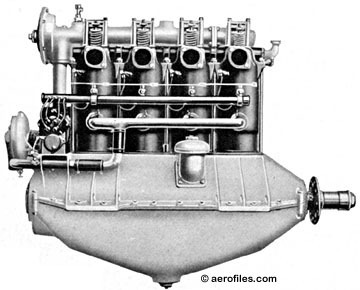 C-6 c.1919 = 80hp 6RA. Indian c.1911 = 65hp 452.4ci 8VW; dry wt: 200#. Used by Glenn Curtiss for long-distance flights at the Harvard Aviation Meet. Indian 19?? = 50hp@1100rpm 513ci 7RA rotary; dry wt: 185#. Herman David L Herman, Detroit MI. P-60, O-49 1997 = 58hp 48.7ci 2HOA. Hiller Stanley V Hiller, Alameda CA. 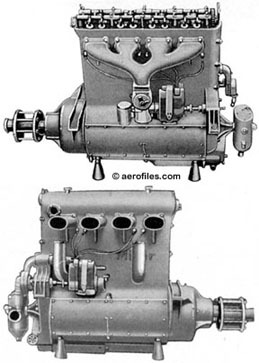 1911 = 30hp 6RA rotary, two-cycle. 1912 = 60hp 6RA rotary; built by C E Kelsey, San Francisco. 1913 = 90hp unknown type. Hofer Al Hofer, Chicago IL. Holbrook Holbrook Aero Supply, Joplin MO. Hopkins & DeKilduchevsky (Edwin) Hopkins & (Paul) DeKilduchevsky, New York NY. 1910 = 30-40hp unknown type. 1910 = 60-80hp unknown type. 19?? = 100hp@1000rpm to 120hp@1200rpm 693.8ci 10RA; dry wt: 320#. Hurricane Hurricane Motors, Inc, Houston TX. 19?? : Detroit MI. C-450 1928 = 150hp 8cyl unknown type. Imperial Imperial Airplane Society, Denver CO.
1911 = 35-70hp various 6RA rotary. 1911 = 100hp 12RA rotary. Irwin 1919: Irwin Aircraft Co, Sacramento CA; 1928: Corning CA; 1930: Watsonville CA. 79 aka X c.1926 = 20hp 79ci 4XA. 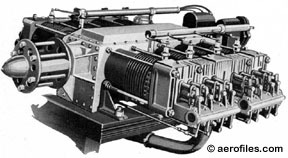 Meteormotor 1922 = 20-25hp 4XA. Jacobs 1910: Henry William Jacobs, dba Multiplane Ltd, Atchison KS. Jacobs 1928: (Albert R) Jacobs & Fischer, Camden NJ; 1930: Jacobs Aircraft Engine Co, Pottstown PA. c.1973: Page Industries, OK.
B-1 c.1929 = 20hp 2HOA. L-3 1930 (ATC 75) = 55hp 191ci 3RA. 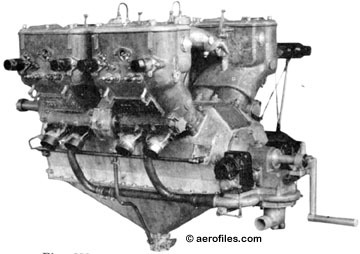 L-4, R-75) 1933 (ATC 121) = 225-245hp 589-757ci 7RA. L-5 1935 (ATC 156) = 285hp 831ci 7RA. L-6, R-915 19?? (ATC 195) = 300-330hp 914ci 7RA. 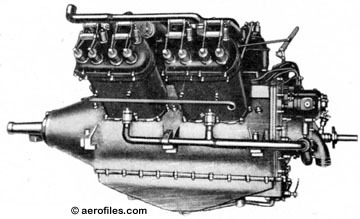 LA-1 1929 = 140hp 7RA. Albert Jacobs, from ACE La-1. LA-1 1931 (ATC 31) = 170hp 7RA. 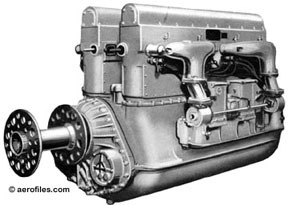 O-200 1946 = 85hp 201.1ci 4HOA. 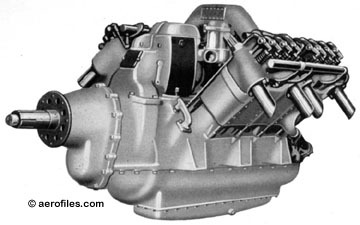 O-240, O-240A 1946 = 100hp 240.5ci 4HOA. 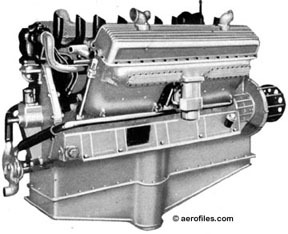 O-360, O-360A 1947 = 165hp 360.8ci 6HOA. R-755E, -755S 19?? (ATC 237) = 275-350hp 757ci 7RA. Helicopter power; S produced by Page Industries. Johnson Johnson Aircraft Building Shop, Terre Haute IN. 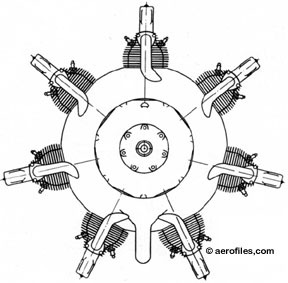 Aero c.1909 = 75hp@1300rpm 471.24ci 4VW; dry wt: 298#. Aero c.1909 = 100hp@1300rpm 628.32ci 8VW; dry wt:508#. 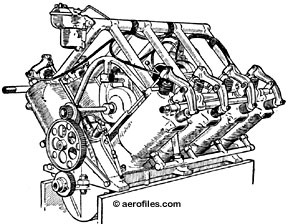 Aero c.1909 = 150hp@1300rpm 942.48ci 12VW; dry wt: 598#. Kemp aka Grey Eagle (George W) Kemp Machine Works, Muncie IN. D-4 1911 = 35-40hp 255.36ci 4LA; dry wt: 185#. E-6, H-6 1912 = 50-55hp@1150rpm 383.04ci 6LA; dry wt: 272#. G-2, O-101 1913 = 16hp 100.5ci 2HOA. I-4 1913 = 35hp@1150rpm 225.36ci 4LA; dry wt: 192#. J-8 1913 = 80hp@1150rpm 539.04ci 8VA; dry wt: 380#. -Henderson 19?? = 27hp 4LA. Converted motorcycle engine. 1917 = 200hp@2400rpm 531.63ci supercharged geared 6LW. Ran a four-stroke cycle, but at the bottom of the intake stroke ports were opened to admit added air under pressure, governed by a rotary valve connected to the throttle, into the combustion chamber, which reportedly produced a compression ratio as low as 3.66:1. 6C-400 1918 = 400hp 855.3ci 6LW; dry wt: 578#. Six-valves experimental; POP: 1. Kimball Kimball Aircraft Crp, Naugatuck CT.
Beetle K 19?? (ATC 34) = 120-135hp 7RA. Gnat M 1928 = 25hp 2HOA. King Brewster & Co, Long Island NY. 1918 = 550hp@1886rpm 1995ci 12VW; dry wt: 990#. Charles B King. Contemplated replacement for the Liberty 12A. POP: 5 built for testing at McCook Field. -Bugatti 1917 = 420hp 16LLW; dry wt: 1248#. 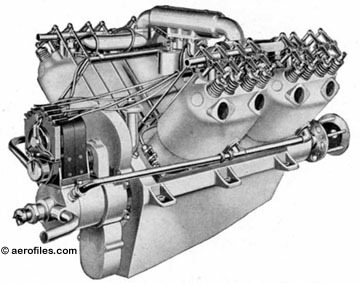 Modified and improved version of the Italian engine, built at Duesenberg Motors Corp under the direction of C B King. Aluminum water jackets. Kinner Kinner Motors, Glendale CA. B-5, B-54, R-440 1930 (ATC 51) = 125hp 372ci 5RA. C-5, R-715 1930 (ATC 62) = 210hp 712ci 5RA. C-7 19?? (ATC 122) = 300hp 1044ci 7RA. K-5 1928 (ATC 3) = 100hp 372ci 5RA. O-550, O-552 1943 = 225-250hp 552ci 6HOA. R-5, R-55, R-540 19?? (ATC 77, 153) = 160hp 540ci 5RA. R-53 19?? = 175hp 540ci 5RA. R-56 19?? = 160hp 540ci 5RA. SC-7 19?? (ATC 175) = 350hp 1044ci 7RA. Kirkham (Charles B) Kirkham Aeroplane & Motor Co, Savona NY. SEE ALSO Curtiss-Kirkham. B-4 1910 = 40hp@1400rpm 235.92ci 4LW; dry wt: 180#. B-6 1911 = 54hp@1300rpm and 50hp @ 1250rpm 380.88ci 6LW; dry wt: 235#. B-12 1912 = 120hp 12LW. BG-6 1912 = Geared version of B-6; 76hp@1680rpm (prop: 960rpm) 299.44ci 6LW; dry wt: 190#. C-4 1911 = 45-50hp 4LW. 1916 = 300hp@1600rpm 1488.53ci geared 12VW; dry wt: 1400#. Cast aluminum cylinders set at 60° angles. Lambert (Sam) Lambert Aircraft Corp, St Louis MO. 19?? 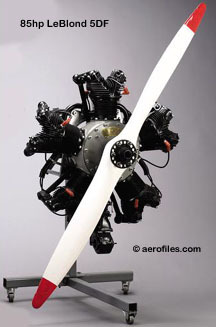 : Monocoupe Aeroplane & Engine Sales Corp of America, Universal Moulded Products, Orlando FL. H-106, O-106 1930 = 35hp 106.4ci 2HOA. POP: 2. R-266 1930 = (ATC 38) 90hp 266ci 5RA. Lawrance, Lawrance-Moulton 1910: (Charles L) Lawrance Aero Engine Co, New York NY. 1923: Acquired by Wright Corp, with Lawrance as vice-pres. A-3 1916 = 28hp@1400rpm 3RA. C L Lawrance. POP: 450 built under license by Excelsior for use on flightless Breese Penguin trainers. B 1916 = 60hp 3RA. J-1 1920 = 220hp@1800rpm 727ci 9RA; dry wt: 442#. 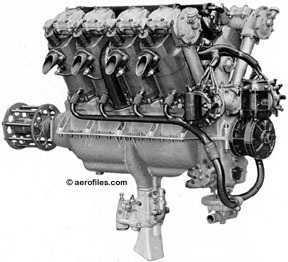 First major USN aviation engine contract; evolved into Wright J series. J-2 1922 = 250hp 9RA. POP: 2. L-2 c.1920 = 56.5hp@1600rpm to 65hp@2000rpm 223.44ci 3RA. 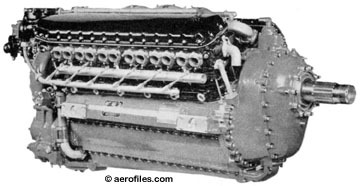 L-4, L-64 1920 = 65hp 3RA. N, N-2, O-120 1917 = 40hp@1900rpm 120.58ci 2HOA; dry wt: 79#. For USN evaluation. 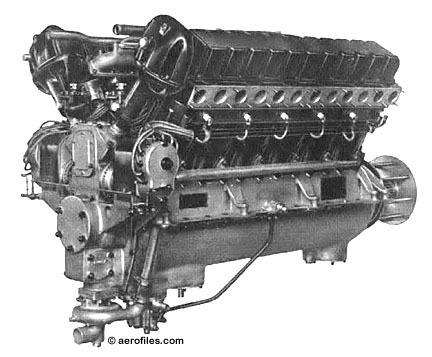 R-1 1921 = 140-150hp 670ci 9RA. Expanded 3RA for testing by Engr Division of USAS. -Moulton A (France) 1913 = 8VW. POP: 1 for display at Paris Intl Exposition. -Moulton B (USA) 1916 = 200hp@1800hp 921.52ci 8VW; dry wt (incl exhaust manifolds): 916#. Lee c.1929: Lee Motors Inc, Collegeville PA.
LeBlond LeBlond Engines Inc, Cincinnati OH. LeBlond Aircraft Engine Corp. Rearwin (LeBlond) Aircraft & Engines Inc.
60-5D 1928 (ATC 12) = 60hp 5RA. From Detroit Air Cat. 70-5E, -5DE 1930 (ATC 48) 1930 = 70hp 251ci 5RA. Became Rearwin Ken-Royce 5E. 75-5DE 1930 = 75hp 5RA. 80-5F 1930 = 80hp 5RA. 85-5DF 1930 (ATC 46) = 85-90hp 266ci 5RA. 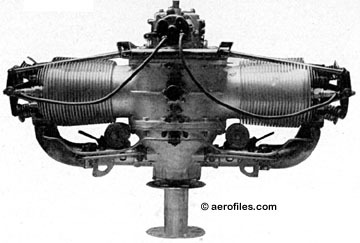 90-5F, -5G 1930 (ATC 46) = 90hp 5RA. Became Rearwin Ken-Royce 5G. 90-7D 1929 (ATC 20) = 90hp 7RA. 110-7DF 1930 (ATC 52) = 110-120hp 372ci 7RA. Became Rearwin Ken-Royce 7G. 120 1929 = 120hp 5RA. Lenape Lenape Aircraft & Motors, Matawan NJ. LM-3, LM-365 Papoose 19?? (ATC 203) = 50-65hp 160-167ci 3RA. 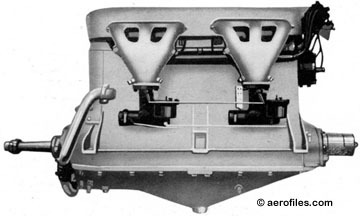 Improved Aeromarine AR. LM-5, LM-125 Brave 19?? (ATC 212) = 95-125hp 267ci 5RA. LM-7 Chief 19?? = 150hp 378ci 7RA. LM-375 Papoose 19?? (ATC 215) = 75hp 170ci 3RA. Liberty 1917: Packard Motor Co, Detroit MI. 1919: Liberty Engine & Foundry Co, Seymour CT.
4, L-4 1918 = 100hp 4LW. POP: Only a few built by Hudson Motor Car Co, Detroit MI. None was used for flight. 6, L-6 1917 = 231hp@1700rpm to 240hp@1850rpm 824.46ci 6LW; dry wt: 567.5#. Charles Hall, J G Vincent. POP: about 50 built by Hall-Scott and Thomas-Morse Co. Conflicting data in the 1921 Angle book claims a total production of only 6, all built by T-M. 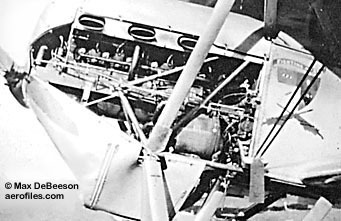 Redesigned at McCook Field in 1920, and 10 engines were ordered by USAS. 8 1917 = 290hp@1700rpm to 317hp@2000rpm 1099.28ci 8VW; dry wt: 638#. POP: 15 built by Buick Co; vibration problems ended production, as well as a decision that more power was needed for combat aircraft (SEE following). 12 1917 = 400hp@1800rpm 12VW; dry wt: 900#; distributor ignition. Charles Hall, J G Vincent. Prototype agreed upon by the joint Army-Navy Technical Board on 6/4/17 as the standardized design. First evaluative unit delivered (7/3/17) was the 8-cyl model, but field reports from France indicated it would rapidly be obsolete, and production was switched to the 12-cyl design. After completing 50-hr testing, the first one of these was delivered on 8/25/17. POP: 20,478 produced by Ford, General Motors, Lincoln, Marmon, Nordyke, Packard; in use as late as 1936. 12A 1917 (Group 2) = 421hp@1700rpm to 449hp@1940rpm 1648.92ci 12VW; dry wt: 844#. Principal production version. 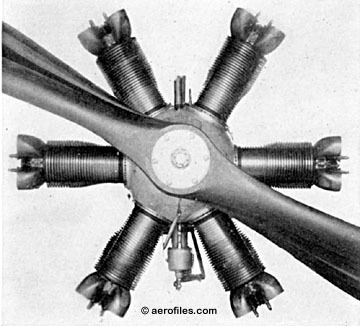 12-C 1919 = Failed attempt to produce a 12-A with spur-geared prop drive. POP: 1. Project abandoned after flight tests. 24 1918 = McCook Field experiment with two Liberty 12s belly-to-belly in an X-form with a common shaft, producing 740hp/1782 rpm, but with breakdowns from the added stress. POP: 1. Light Light Mfg & Foundry Co, Pottstown PA.
Kitten 20 19?? = 20hp 77ci 2LAI; aka Brownback. Kitten 30 19?? = 25hp 77ci 2LAI. Tiger 100 19?? = 90-100hp 397ci 6RA. Tiger 125 19?? = 125hp 464ci 7RA. Tiger Junior 50 19?? = 50hp 154ci 4HOA. Lincoln Lincoln Aircraft Co, Lincoln NB. 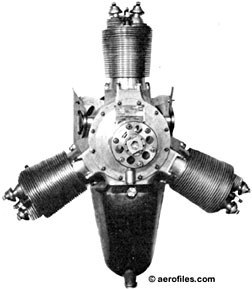 Rocket c.1933 = 29hp 2HOA. Remanufacture of Wright-Morehouse. Long Harlequin Les Long, Beaverton OR. 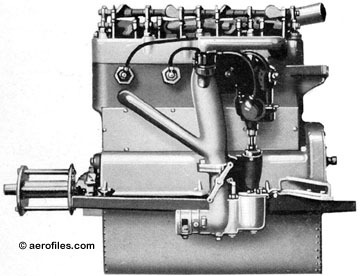 1933 = 30-35hp96.2 ci 2HOA. Henderson motorcycle engine conversion. Loughead 1916: (Allan and Malcolm) Loughead Aircraft Mfg Co, Santa Barbara CA. 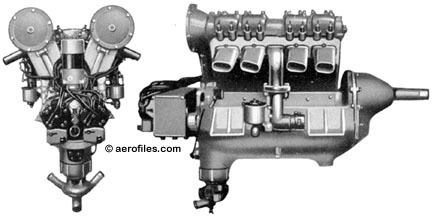 XL-1 1919 = 25hp 92.9ci 2HOA. Anthony Stadlman. Lycoming Lycoming Div, Aviation Mfg Corp, Williamsport PA. 19?? 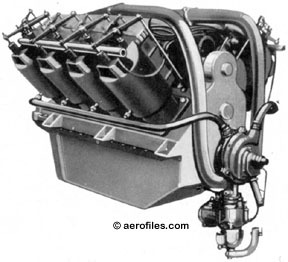 : Avco Lycoming. O-145 1937 (ATC 199, 210) = 50-75hp 144.5ci 4HOA; dry wt: 160#. O-160 1985 = 70-80hp 159.9ci 1HOA. O-235 1940 = 115-125hp 233ci 4HOA. O-290 1942 = Similar to O-235. 127-140hp 289.3ci 4HOA. O-320 1951 = 180-205hp 319.7ci 4HOA. Prefixes: AEIO, AIO, IO, LIO. O-340 1954 = 160-170hp 340.4ci 4HOA. O-350 1941 (ATC 227) = 150hp 349.5ci 6HOA. O-360 1955 = 168-210hp 361ci 4HOA. Prefixes: AEIO, AIO, HO, IO, IVO, HIO, LHIO, LO, LTO, TIO, VO. O-390-X 2002 = 210hp 388.9ci 4HOA. Prefixes: IO. O-435 1942 = 190-280hp 434ci 6HOA. Prefixes: GO, TVO, VO. O-480 1954 = 270-340hp 479.6ci 6HOA. Prefixes: GO, IGO, GSO, IGSO. O-540 1957 = 235-380hp 541.5ci 6HOA. Prefixes: AEIO, HIO, IGO, IGSO, IO, IVO, LTIO, TIO, VO. O-541 1965 = 310-450hp 541.5ci 6HOA. Prefixes: TIO, TIGO. O-580 1948 = 320-375hp 578ci 6HOA. Prefixes: IO, GSO, SO. O-720 1961 = 375-400hp 722ci 8HOA. Prefixes: IO. O-1230 1939 = 1000-1200hp 1234ci 12HOA. R-500 19?? = 145hp 529ci 7RA. R-530 1937 (ATC 182, 183) = 190-220hp 529ci 7RA. Based on R-680. R-645 1929 (ATC 27) = 185hp 9RA. R-680 1930 (ATC 42, 81, 108, 110, 111, 172, 173) = 215-260hp 680ci 9RA. 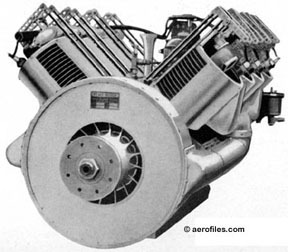 The 36-cylinder Lycoming XR-7755 prototype engine was the largest reciprocating aircraft engine ever built. Displacement was 7,755cicompared to Lycoming's largest production engine, which displaced 720ci, it was more than ten times larger! 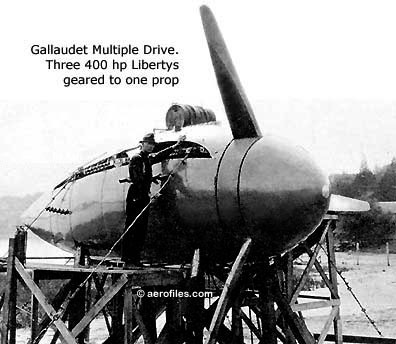 Ten feet long and five feet in diameter, it weighed 6,050 pounds, produced 5,000hp at 2,600rpm (the target was 7,000hp), but used 580 gph avgas in so doing! There were nine overhead camshafts which could be shifted axially for METO power in one position and cruise at the other. 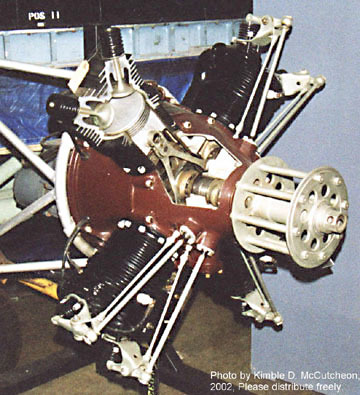 Two main shafts emerged for coaxial propellers, and there was a two-speed gear-change box between the crankshaft and the propeller shafts. XR-7755 was born in the summer of 1943, but with the end of World War II in 1945, the military no longer had use for an engine this size, and development ended. MacClatchie (J Warren) MacClatchie Mfg Co, Compton CA. X-2 Panther 1928 (ATC 49) = 150hp 612ci 7RA. 1911 = 50-60hp 7RA rotary. Barrel-shape design with cylinder axes parallel to a central shaft. Manly Charles Manly, Washington DC. 1901 = 52.4hp@950rpm 539.96ci 5RW; dry wt: 151#. 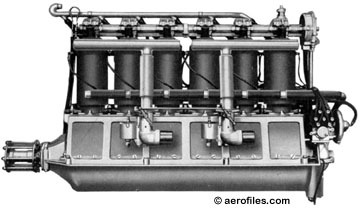 First engine specifically intended for aircraft use (Langley Aerodrome), based on a Stephen Balzer design of 1899. 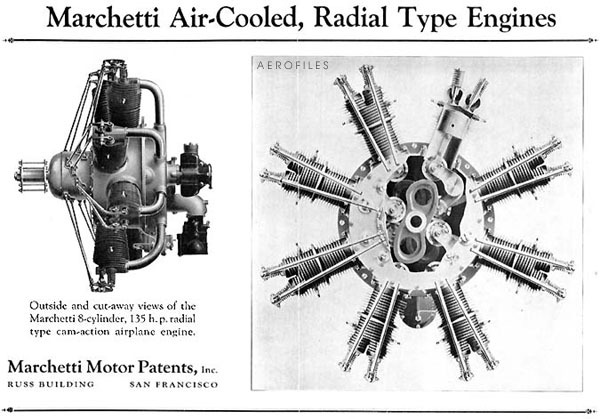 Marchetti (Paul) Marchetti Motor Patents Inc, San Bruno CA. 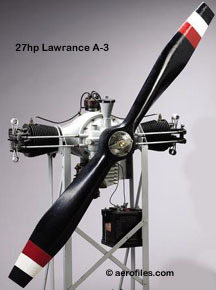 A 1927 = 175hp 8RA. POP: apparently only 1 prototype built. Marlin-Rockwell Marlin-Rockwell Co, New Haven CT.
1919 = 72hp@1825rpm 235.62ci 2HOA. dry wt: 133#. J L Cato. 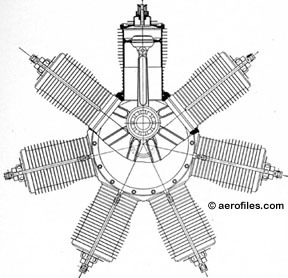 The largest-bore, all-ball bearing, air-cooled motor to successfully fly a lightplane in its day and to run cool. 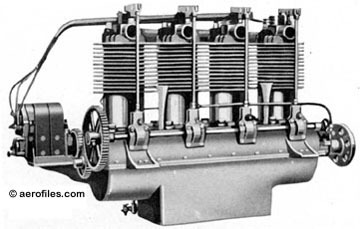 Cylinder head design set a standard for all air-cooled motors to follow. Martin Glenn L Martin Motors Co, Baltimore MD. 333 19?? = 120hp 333ci 4LAI. Became Chevrolair 333. 8200 c.1919 = 190hp@1400rpm 940.8ci 8VW; dry wt: 484#. c.1915 = 6LW; no data. Maximotor Maximotor Makers, Detroit MI. McDowell George McDowell, Brooklyn NY. 1912 = 50hp 301.24ci 4LW; dry wt: 250#. Sport 1967 = 65hp 96.7ci 4HOA. Menasco (Albert) Menasco Motors, Los Angeles CA; Burbank CA. A-4 Pirate 1930 (ATC 50) = 90hp 326ci 4LAI. A-6 Buccaneer 1930 (ATC 69) = 140hp 6LAI. B-2 19?? = 260hp unknown type. B-4 Pirate 1930 (ATC 65) = 95hp 326ci 4LAI. B-6 Buccaneer 1930 (ATC 68) = 160hp 489ci 6LAI. B-6S Buccaneer 1938 (ATC 139) = 200hp 489ci 6LAI. C-4 Pirate 1930 (ATC 67) = 125hp 363ci 4LAI. C-4S Pirate 1930 (ATC 134) = 150hp 363ci 4LAI. C-6 Buccaneer 19?? = 290hp 545ci 6LAI. C-6S Super Buccaneer 19?? (ATC 197) = 260hp 545ci 6LAI. D-4 Super Pirate 1930 (ATC 67) = 125hp 363ci 4LAI. D-4B Super Pirate 19?? (ATC 134) = 150hp 4LAI. D-6 Super Buccaneer 19?? = 260-390hp 545ci 6LAI. L 19?? = 50hp unknown type. M-50 Pirate, O-145 1937 (ATC 191) = 50hp 144.3ci 4HOA; dry wt: 156#. U-2 Unitwin 19?? = 600hp 1088ci twin 12LAI. Two engines merged as one. -Salmson B-2 19?? = 230-260hp 9RA. 19?? = 125hp@800rpm 1690.85ci 7RA; dry wt: 375@. 1911 = ?hp 196.35ci 2RA. Both cylinders fired simultaneously each revolution; two-stroke cycle with an independent exhaust valve. Valves had no springs and were held in their seats by centrifugal force and operated by pushrods and rockers. Miller (Harry A) Miller Mfg Co, Los Angeles CA (auto racing engines and carburetors). c.1920 = 139hp@2600rpm to 155hp@2900rpm 351.84ci geared 4LW; dry wt: 410#. Leslie C Miller. c,1920 = ?hp 1413.72ci 12VW. Based on the Duesenberg auto engine. 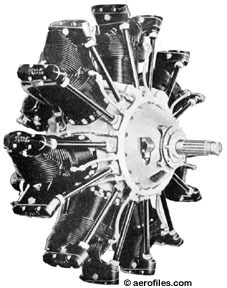 1928 = Rebuilt and modified Curtiss OX-5. Milwaukee Tank Milwaukee Parts Corp, Milwaukee WI. V-470 1930 (ATC 63) = 115hp 8VA. Frank Tank. 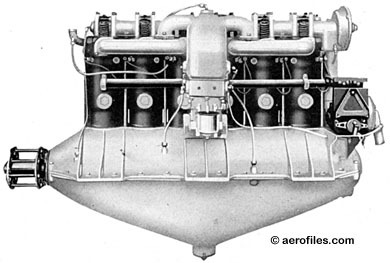 V-502 (OX-5) 1931 (ATC 73) = 115hp 8VA. Morehouse 1924: Harold Morehouse, Dayton OH. 1926: Merged with Wright Aero Corp. c.1933: Design purchased by Lincoln Aircraft Co. 1935: Rights sold to National Airplane & Motor Co, Billings MT. 1924 = 15hp 2HOA used to inflate Army balloons. 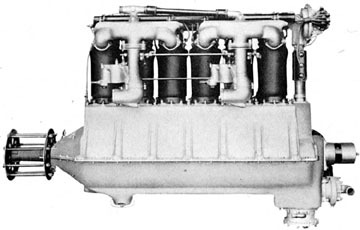 1925 = 29hp 80ci 2HOA for Roché-Dohse Flivver; first commercial design. M-42, O-42 1924 = 12-20hp 42.4ci 2HOA, likely the same one as above. M-80, O-80 1925 = 28hp 80.1ci 2HOA, likely the same one as above. Murray, Murray-Willat1910: Murray-Willat Co, no location. 19?? : Aircraft Holding Co, Culver City CA. 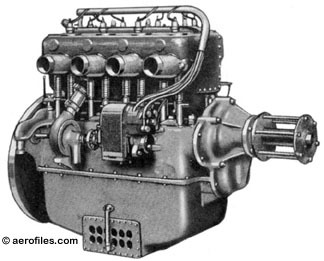 Ajax 1927 = 80hp 6RA. Modification of 1912 Murray-Willat. 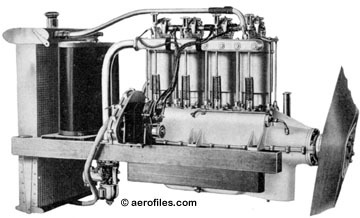 Atlas 1927 = 120hp 8RA. -Willat 1910 = 35hp@1200rpm 145.68ci 6RA rotary; dry wt: 123#; diam: 25.98". Valveless, two-stroke cycle. 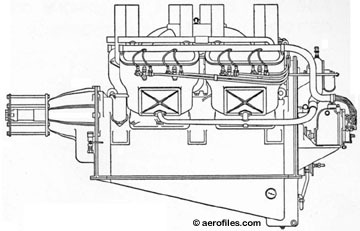 An integral blower compressed the air and forced fuel into the engine. -Willat c.1911 = As previous, but 90hp@1200rpm 374.52ci 6RA rotary; dry wt: 260#; diam: 29.0". National National Motor Co, Ligonier PA.
Northrop Northrop Group, Hawthorne CA. 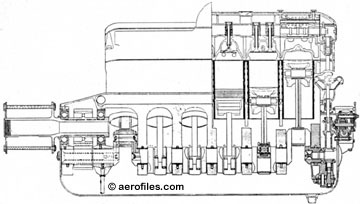 Turbodyne XT-37 1947 = 5150hp axial-flow gas turbine. Two prototypes tested on Northrop EB-35B Flying Wing, but project abandoned on 1949 when funds ran out. Patents and data went to General Electric in 1950. Orlo Orlo Motor Co, Rochester NY. B-4 1916 = 50hp@1300rpm 381.69ci 4LW; dry wt: 220#. B-6 1916 = 75hp@1300rpm 572.54ci 6LW; dry wt: 270#. B-8 1916 = 100hp@1300rpm 763.37ci 8VW; dry wt: 480#. 299 1922 = 100hp@2300rpm to 130hp@3300rpm 12VW; dry wt: 500#. POP: 2 racing engines. 452 1916 = 140hp@2000rpm 452ci 6LW. POP: 2. 1A-258 1922 = 50hp@1500rpm 258ci 4L. POP: 1 test engine. 1A-744 1919 = 180hp@1600rpm 744ci 8VW; dry wt: 542#. POP: 9. 1A-825 1921 = 230hp@1800rpm 825ci 8VW; dry wt: 547#. POP: 12. 1A-905-1, -2, -3 1916-1917 = (-1): 235hp@1800rpm (-2): 275hp@2000rpm (-3): 285hp@2000rpm 905ci 12VW; dry wt: 800-990. POP: 1 each. 1A-1100, L-8 1917 = 275hp@1700rpm 1100ci 8VW; dry wt: 525#. POP: 6. 1A-1116 1919 = 270hp@1600rpm 1116ci 12VW; dry wt: 733#. POP: 6. 1A-1237, V-1237 1920 = 315hp@1600rpm 1237ci 12VW; dry wt: 734#. POP: c.50. 1A-1300 1923 = 375hp@1700rpm 1300ci 12VW; dry wt: 684#. 1A-1464 1924 = 475hp@2000rpm 1464ci 12VW. 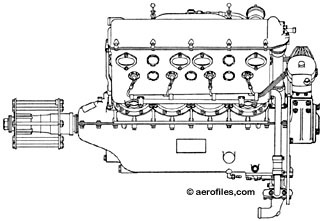 1A-1530 1924 = 510hp 1530ci 12VW. 1A-1551 1921 = 300hp@1400rpm 11551ci 6LW; dry wt: 1,138#. 1A-1650 1919 = 420@1750rpm to 446hp@1900rpm 1650ci 1650ci 12VW; dry wt: 860#. POP: c.80, post-war production of Liberty 12-A. 1A-2025 1920 = 555hp@1800rpm 2024.9ci 12VW; dry wt: 1,150#. POP: 11. 1A-2200 1923 = 600hp@1800rpm 2205ci 12VW. POP: 1. 1A-2500 1924 = 800hp@2000rpm 2540ci 12VW; dry wt: 1,120#. POP: c.6. 1A-2775, 2A-2775 aka X-2775 1926 = 1250hp 2775ci (2x 1500ci) 24XW; dry wt: 1,513#. $25,000; POP: 1 for USN Schneider Trophy, but float problems kept aircraft from competing. Rebuilt in 1927 or 1928 (>1935) as supercharged experimental 2A-2775; 1400hp@2600rpm to 1500hp@2700rpm; dry wt: 1,635#. 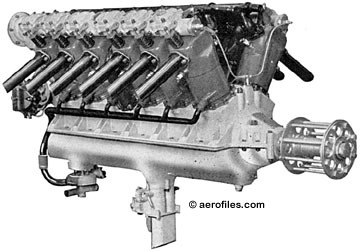 1A-5000, 2A-5000, 3A-5000 1939 = 3000-3500hp "H"-head experiments. Unknown if any were actually built. 2A-1237 1923 = 315hp@1600rpm 1237ci 12VW. 2A-1500 1923 = 525-700hp 1498ci 12VW; dry wt: 1,210#. Based on wartime Liberty 12. POP: c.200. 2A-2500 1925 = 800hp@2000rpm 2540ci 12VW; dry wt: 1,120#. POP: c.75. 3A-1500 1927 (ATC 18) = 500hp@2000rpm to 600hp@2500rpm 1498ci 12VW; dry wt: 1,530#. POP: c.20. 3A-2500 1927 (ATC 19) = 800hp@2000rpm 2490ci 12VW. POP: c.175. 4A-2500 1927 = 900hp@2000rpm 2490ci 12VW. 5A-2500 19?? = 1500hp@2500rpm 2490ci 12VW. DR-980 1928 (ATC 43) = 225hp@1950rpm 980ci 9RA diesel. POP: c.100. First diesel to fly, in Stinson SM-1DX [X7654] on 9/19/1928 (p: Herman Dohner, Lionel Woolson). Also used to set unrefuelled endurance record of 84h:32m on 5/28/31, which was not broken until the Rutan-Yeager Voyager global flight in 1986. DR-1340 1932 = 550hp@2200rpm 1340ci 9RA diesel; dry wt: 1050#. Two-cycle. POP: 2. DR-1655 1932 = 550hp@2100rpm 1655ci 9RA diesel; dry wt: 1150#. POP: 1 for testing. LA-12A 1918 -The Packard Liberty. 410@1750rpm 1650ci 12VW. POP: 5,346 incl 5 experimentals. LA-12B 1918 = 420@1750rpm 1650ci epicyclic-geared 12VW. POP: 6. LA-12C 1918 = 400@1750rpm 1650ci spur-geared 12VW. POP: 3. LA-12E aka Liberty Double 1918 = 400@1700rpm 1650ci duplex 12VW; dry wt: 1,136#. 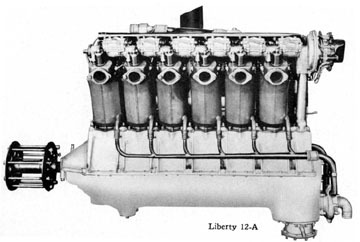 Experimental, widened Liberty 12-A with two crankshafts geared to a single propshaft, which was hollow to permit firing of a cannon mounted between the cylinder banks. The idea was never fully developed. POP: 1. LA-12N 1918 = 360@1700rpm to 390hp@1900rpm low-compression 12VW. POP: 1,501 for USN. 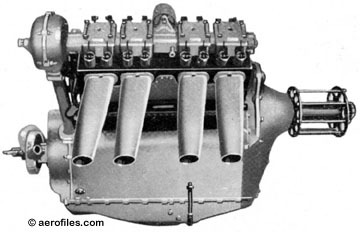 V-12 1917 = 250hp 905ci 12VW. Jesse Vincent. 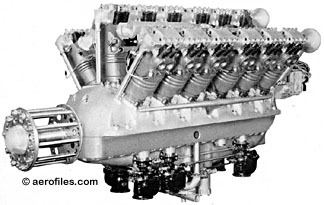 V-1650-1 1941-45 = Licensed wartime production of Rolls-Royce (US model) and Merlin (UK model) 1385-2280hp 12VW. POP (total R-R V-1650-1 to -25, and Merlin 28 to 69 and 224 to 301): 55,873. W-1 1921 = 710hp@1700rpm 2832ci double 18VW; dry wt: 1720#. Designed by USAS. POP: 4. W-1-A 1923 = 700hp@1700rpm 2832ci double 18VW; dry wt: 1770#. Designed by USAS. POP: 5. W-1-B 1923 = 1000hp@1700rpm 2832ci double 18VW. POP: 5. Designed by USAS. W-2 1923 = 700hp@1700rpm 4980ci double 18VW. POP: 2. Designed by USAS. Palmer (Harry) Palmer Motor Co, Boston MA. 1929 = 80hp 4RA experimental. Aviation application unknown. Parker Aero Parker Motor Sales Co, St Paul MN. 1912 = Advertised "3 Models, 3 weights. 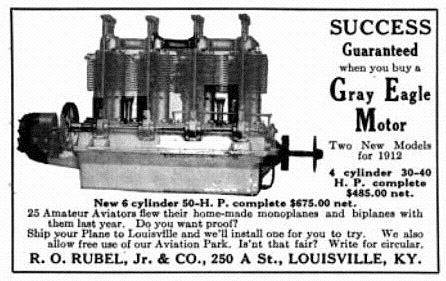 and 3 prices" for 3- and 6-cyl motors, 30 to 80hp. Phillips Phillips Aviation Co, Van Nuys CA. 333 (Martin 333) 1929 (ATC 59) = 120hp 333ci 4LAI. Louis Chevrolet. 500 1941 = 180hp 500ci 6LAI. Pierce (Samuel S) Pierce Airplane Co, Southhampton, Long Island NY. B 191? = 35hp 226.19ci 3RA. Pobjoy (David R) Pobjoy Aeromotors & Aircraft Ltd, Great Britain.. No US manufacture known, but the motors were popular here for their economy and weight. Cataract aka Model R 1932 = 75-80hp geared 7RA. Cascade aka Model P c.1929 = 67-70hp 7RA. Only 25" in diameter. Niagara I (ATC Restricted) 1934 = 90hp geared 7RA; enclosed valve gears. Follwed by 95hp Niagara III (c.1936) and 135hp Niagara V (1937). 3-40 19?? = 40hp 142ci 3RA. 3-50 19?? = 50hp 142ci 3RA. 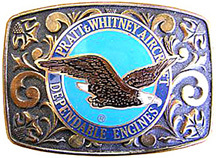 Pratt & Whitney 1925: Pratt & Whitney Div, United Aircraft Corp, Hartford CT. 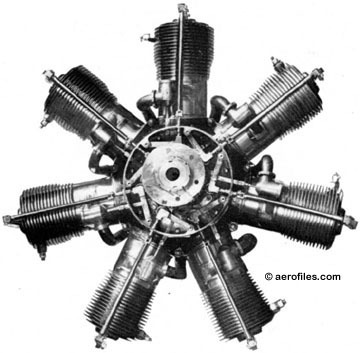 While not the first radial aircraft enginethat was an operating six-cylinder with two banks of three cylinders and a double-throw crankshaft built in 1913 by J W Smith in Cicero ILthe Pratt & Whitney was certainly the most successful. 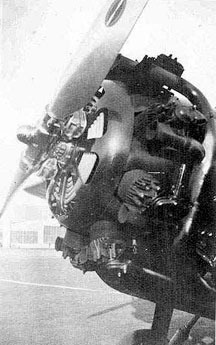 When Frederick B Rentschler and a group of Wright engineers left that company and formed their own group in 1925 to produce the nine-cylinder R-1340 Wasp, they had neither official organization nor name when the prototype was submitted to USN for evaluation. The very un-aviation Pratt & Whitney Machine Tool Division of Niles-Bement-Pond Corp (Hartford CT) had made castings for the prototype and cast its name in the metal housing. Navy evaluators dutifully transcribed this name into their records and a company was born, even though there was no actual connection with the original tool manufacturer. The first Wasp (410hp), designed by George Mead and Andy Willgoos, was completed on Christmas Eve 1925, passed USN tests in March 1926, and a Boeing F2B-1 was selected as the first operational plane to use the new motor. 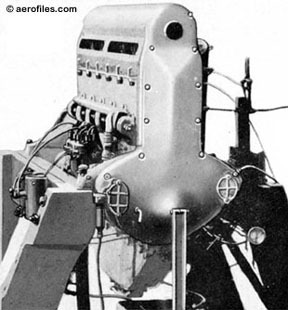 H-3730 (X-3130) 1940 = 24-cyl, liquid-cooled, H-type, 2240ci experimental with sleeve valves; only one built. Hornet A, A-1, A-2, A-3 1928 (ATC 15) = 525hp 1690ci 9RA. Hornet BG 1930 = 550hp 1860ci 9RA. Hornet Junior 19?? = 300hp 985ci 9RA. Hornet S1A 19?? = 400hp 985ci 9RA. Hornet S1E, S1E3 19?? (ATC 136) = 850-875hp 9RA. Hornet S2E 19?? (ATC 144) = 800hp 9RA. R-985 Wasp Jr 1932 (ATC 5E-1) = 400-450hp 985ci 9RA. R-1340 Wasp (Wasp CG) 1926 (ATC 55, 5E-2) = 410-600hp 1344ci 9RA. George Mead, Andrew Willgoos. The first P&W. R-1535 Twin Wasp Jr 1934 = 625-700hp 1535ci 14RA. R-1690 Hornet A-2G 1927 (ATC 29) = 500-750hp 1690ci 9RA. R-1830 Twin Wasp 1934 (ATC 5E-4) = 700-1200hp 1830ci 14RA. R-1860 Hornet (B, B-1, SB-1, S1B1, S2B1, S3B1) 1929 (ATC 28) = 575hp 1860ci 9RA. R-2000 Twin Wasp 19?? (ATC 5E-5) = 1100hp 2000ci 14RA. 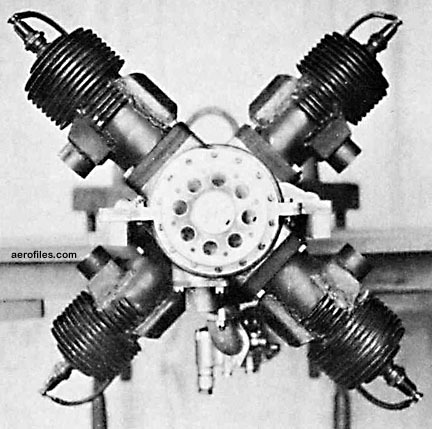 R-2060 1932 = experimental 20-cyl, four-row radial; only one built. R-2180 Twin Hornet A c.1950 = experimental 1150hp twin-row 14RA for prototype DC-4; only one built. 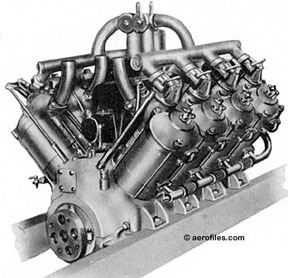 The original R-2180 had a bore of 5.75" and a stroke of 6.0", and so a displacement of 155.8ci per cylinder, with 14 cylinders in two rows of seven each. 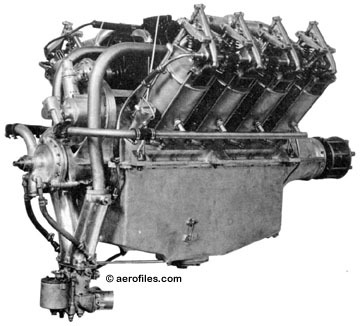 R-2180 received the US Engine Type Certificate 196 on 5/15/38. Besides the DC-4E prototype, it powered two Army prototypes, North American XB-21 and Stearman XA-21. 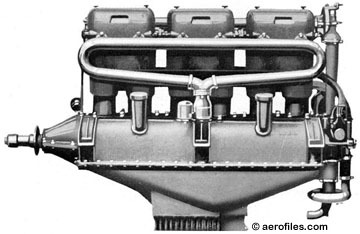 Continued development of the engine was halted so that P&W could concentrate on the R-2800 (18-cyl in two rows) and R-4360 (28-cyl in four rows), which both used cylinders of the same dimensions as R-2180, but were capable of much higher performance for use in WW2. 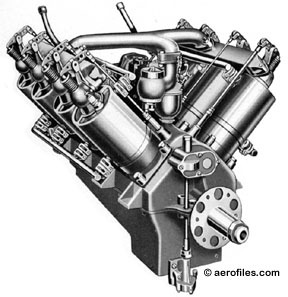 R-2800 Double Wasp 1939 (ATC 5E-8) = 1700hp@2000rpm to 2000hp@2400rpm 2800ci 18RA; dry wt: 2,350#. R-2800 Twin Wasp 19?? = 1800-2300hp 2800ci 14RA. R-4360 Wasp Major 1943 = 3000hp 4360ci 28RA. Twin Wasp SB-G, SB3-G 19?? (ATC 158) = 1000hp 14RA. 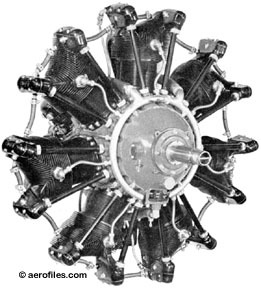 Wasp A, B, C, C1, CD 1925 (ATC 14) = 420-450hp 1344ci 9RA. Wasp Jr A 1930 (ATC 39) = 300hp 985ci 9RA. Wasp Jr T1B 19?? (ATC 113) = 400hp 9RA. Wasp Jr TB, T3A 1931 (ATC 85) = 420-440hp 9RA. Wasp S1D1 19?? = 550hp 9RA. Wasp S3D1 19?? (ATC 128) = 450hp 9RA. Wasp SC, SC-1 1930 (ATC 58, 90) = 450hp 1344ci 9RA. Wasp T1D1 19?? (ATC 91) = 525hp 9RA. Wasp T2D1 19?? (ATC 145) = 420hp 9RA. Aeromaxx 100, O-120 2002 = 118hp 121.9ci 4HOA. Quick (Charles Eric) Quick Motors Co, Wichita KS and Houston TX. 19?? = 120-125hp 667ci 9RA. 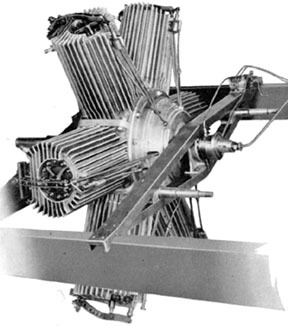 Static rebuilt Le Rhône rotary. Ranger Ranger Aircraft Engines, div Fairchild Engine & Airplane Corp, Farmingdale NY. 19?? : Fairchild Industries, Deer Park NY. 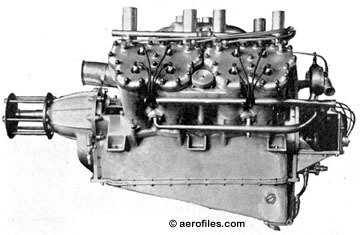 6-375 c.1929 = 100hp 6LAI. Only one built for testing on Pilgrim KR-135. 6-390 1930 (ATC 57) = 120-145hp 391ci 6LAI. 6-390-B, -390-D 19?? (ATC 146) = 145-150hp 391ci 6LAI. 6-410-B 19?? (ATC 187) = 165hp 411ci 6LAI. 6-440-C, L-440 19?? = 175-200hp 441ci 6VAI. GV-770, SGV-770 19?? (ATC 185, 207) = 420-450hp 773ci 12VAI. SGV-770-C 19?? (ATC 232) = 450-500hp 773ci 12VAI. V-770-B 19?? (ATC 184) = 305-315hp 773ci 12VAI. V-770-SG 19?? (ATC 84) = 420hp 773ci 12VAI. V-880, GV-880 19?? = 405hp@2400rpm to 450hp@2800rpm 882ci 12VAI; dry wt: 610-650#. Rasmussen Hans L Rasmussen, Niles MI. 1934 = 65hp 5RA. 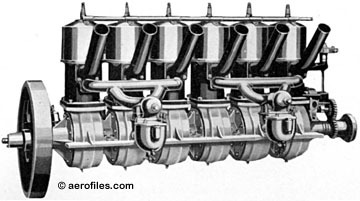 Four valves in each cylinder. Rathel (Fred) Rathel Motor Co, Portland (Daleville) IN. Rausenberger, Rausie Larence [sic] Rausenberger, Bellefontaine OH. E-6 1918 = 175hp 6LW. Rearwin Rearwin (LeBlond) Aircraft & Engines Inc, Cincinnati OH. Ken-Royce 5E 19?? (ATC 48) = 70hp@1950rpm 250.5ci 5RA; dry wt: 245#. Ken-Royce 5G 19?? (ATC 46) = 90hp@2250rpm 266hp 5RA; dry wt: 226#. Ken-Royce 7G 19?? (ATC 52) = 120hp@2225rpm 372ci 7RA; dry wt: 285#. Rinek 1909: Easton Cordage Co, Easton PA; 1910: (Charles Norvin) Rinek Aero Mfg Co.
1909 = 30-45hp 353ci 8VW. 1909 = 40-60hp 572ci 8VW. B-4 1910 = 40hp 201ci 4LW. B-8 1910 = 60hp 402ci 8VW. Roberts (E M) Roberts Motor Co, Sandusky OH. 1910 = 40-52hp 4LW. E M Roberts. 4-X 1912 = 50-60hp 4LW. 6-X 1911 = 75hp 6LW. 6-Z 1925 = 100hp . Robinson William C Robinson, Grinnell IA. Roché Jean A Roché, Dayton OH. L-267 19?? (ATC 37) = 75hp 4LAI. Remanufacture of Rover. Rocky Mountain Los Angeles CA. 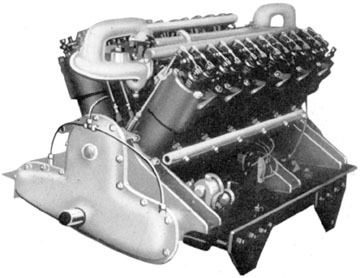 Pegasus 1928 = 225hp 9RA. RI-162F, OL-162 1986 = 152hp 162ci 4HOA. RW-100, OL-100 1967 = 100hp 100ci 4HOA. RW-133, OL-133 1981 = 133-160hp 133ci 4HOA. RW-145, OL-145 1967 = 145hp 145ci 4HOA. RW-152, OL-162 1986 = 152hp 162ci 4HOA. Rover aka Michigan Rover Babcock Rover Michigan Screw Co/Michigan Aero Engine Co, Lansing MI. 1932: Ended production; inventory and ATC sold to Jean Roché. 1939: Acquired by Clarence Chamberlin. 1940: Acquired by Babcock Aircraft Corp.
L-236 1928 (ATC 25) = 55hp 236ci LAI. Harold Morehouse. L-267, R-267 1929 (ATC 37) = 75hp 267ci LAI. One engine bought, and the design copied, by Menasco as basis for their aptly-named Pirate series. Rubel R O Rubel & Co, 250 A St, Louisville KY.
Gray Eagle 1912 = Unknown if Rubel was manufacturer or possibly a sales agent for Kemp (qv). There is a bit of physical similarity between the 30hp 4LAI and 50hp 6LAI and Kemp's Gray Eagle. Ryan-Siemens Ryan Aeronautical Corp, San Diego CA. Licensed US manufacture of Siemens-Halske. Scott 1928: (Leland L) Scott Aircraft Motors, Kansas City MO. 1939: L L Scott & Luther Shelton, partnership, Kansas City MO. 1928 = 40hp two-stroke unknown type. Production assumed through 1949 as company is listed in city directories. Skymotors Sky Motors, Milwaukee WI. 70 19?? (ATC 200) = 60hp 200ci 4LAI. 70A 19?? = 70 with modified crankcase and crankshaft. Smalley General Machinery Co, Bay City MI. 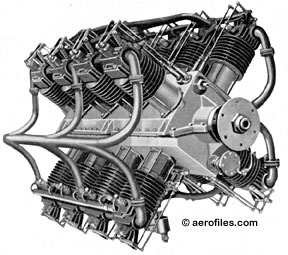 Aero 1910 = four aluminum engines in 2/3/4/6 cyls; no data found. S-2-C 19?? = 120hp 7RA. Sperry Lawrence Sperry Aircraft Co, Farmingdale NY. WBB 1919 = 38hp 4VA. Two-cycle. C Harold Wills. Straughan (Straughan-Holmes) Straughn Aircraft Corp, Wichita KS. AL-1000 1930 = 40hp Ford B conversion. Studebaker-Waterman (Waldo Dean) Waterman Aircraft Mfg Co, Metropolitan Airport, Van Nuys CA. S-1 1936 (ATC 178) = 90hp 6LW. Studebaker auto engine. Sturtevant B F Sturtevant Div, Sturtevant Manufacturing Co, Jamaica Plain MA. 5-A 1915 = 140hp 8VW. 5A-4-1, 5A-4-2 1916 = 210hp 8VW. 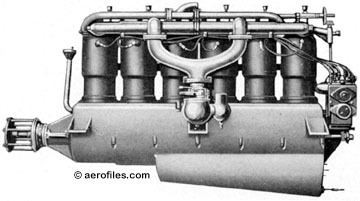 D-4 c.1911 = 50hp 4LW. 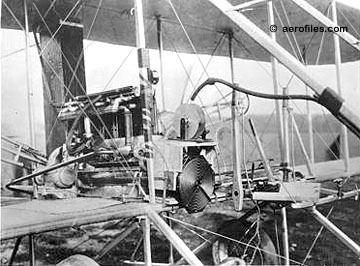 D-6 c.1911 = 60-80hp 6LW. Szekely Szekely Corp, Holland MI. 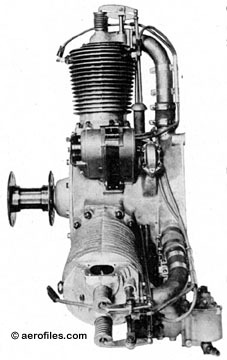 SR-3 1930 (ATC 53, 70) = 30-40hp 191ci 3RA. 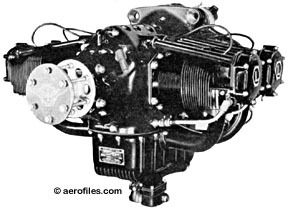 SR-5 1930 = 70hp 3RA. 100 1929 = 100hp 5RA. Only a few built. O-125 1930 = ? ?hp 127ci 2HOA. Twin, O-101 1982 = 50hp 100.5ci 2HOA. O-290 1946 = 100-120hp 289.3ci 4HOA; diesel. Thomas Thomas Aeromotor Co Inc, Ithaca NY. Thomas-Morse Aircraft Corp.
8 aka Aeromotor 1915 = 135hp@2000hp 552.88ci 8VW; dry wt: 600#. 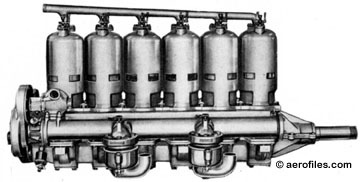 Paired cast L-head cylinders with integrated water jackets. 88 1916 = 150hp@2100rpm 588ci 8VW; dry wt: 525#. 890 1916 = 250hp@2200rpm 873.12ci geared 8VW; dry wt: 590#. Prop speed: 1512rpm. c.1920 = 480hp 1717.67ci twin-row 18RA/W rotary; dry wt: 850#. Unique geared differential rotary with both water and air cooling. 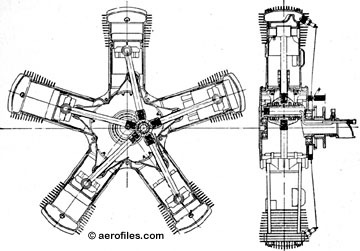 Standard shaft speed was 1800rpm but, via a system of planetary and eccentric gears, prop speed was 1080rpm, while the main body rotated at only 60rpmits slow speed allowed water to circulate from the jackets through 9 tubular radiators between the cylinders, which eliminated the need for water hoses. Tips & Smith Tips & Smith Inc, Houston TX. Super-Rhône c.1924 = 120hp 667ci 9RA. Static rebuilt LeRhône rotary. Union Union Gas Engine Co, Oakland CA. c.1910 = 120hp@1350rpm 691.14ci 6LW. Van Blerck Van Blerck Engine Co, Monroe MI. 1915 = 135hp@1600rpm 699.76ci 8VW; dry wt:�420#. 1915 = 185hp@1400rpm to 200hp@1600rpm 1049.64ci 12VW; dry wt: 600#. Velie (Willard L) Velie Motors Corp, Moline IL. Also produced as Lambert-Velie. 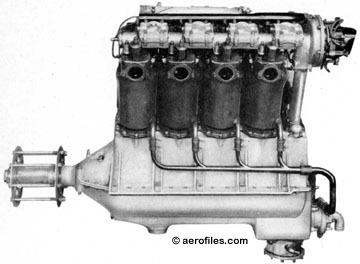 M-5 (ATC 4) 1928 = 55-65hp 256ci 5RA. Based on Detroit Air Cat design. ML-9 1928 = 180hp 9RA. A R Weigel. 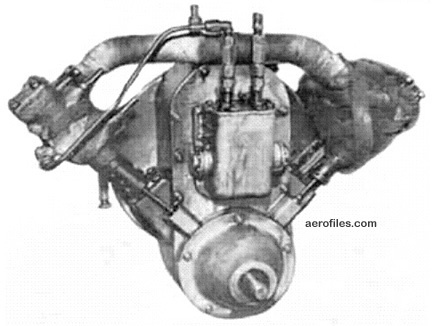 Air Horse, O-113 1938 = 40hp 113.5ci 2HOA. 1919 = 140hp@1600rpm 530.88ci 16XA; dry wt: 306#. Warner 1928: Warner Aircraft Corp, Detroit MI; 1940: Detroit MI. Junior 1928 = 50hp 5RA. Scarab 1928 (ATC 2) = 125hp@2050rpm 422ci 7RA; dry wt: 285#. Scarab Jr 1930 (ATC 54) = 90hp 5RA. Super Scarab (R-500) 19?? (ATC 104(? ), 214) = 165hp@2100rpm 499ci 7RA; dry wt: 332#. Super Scarab (R-550) 19?? (ATC 235) = 185-200hp 555ci 7RA. Welch (Orin) Welch Aircraft Co, Anderson and South Bend IN. O-2, O-135 1934 = 41-45hp 135.2ci 2HOA. Wells & Adams Wells & Adams Motor Co, Bath NY. 1914 = 135hp@1350rpm 763.39ci 8VW; dry wt: 400#. Western Western Enterprise Engine Co, Los Angeles CA. 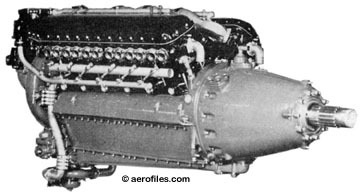 L-7 aka 7-1 1930 (ATC 45) = 170hp 744.25ci 7LA. Whitehead Gustave Whitehead, New York NY. Wiley Post Wiley Post Aircraft Corp, Oklahoma City OK.
AL-1000 1934 = 40hp 4LW. Modified Straughn-Holmes. Williams O E Williams Aeroplane Co, Fenton MI. Wisconsin Wisconsin Motor Mfg Co.Wisconsin Aeroplane Motors, Milwaukee WI. 19?? = 140hp@1400rpm 765.83ci 6LW; dry wt: 600#. 19?? = 250hp@1200rpm 1531.65ci 12VW; dry wt: 1,000#. Doubled version of the previous. Wright Wright Bros, Dayton OH. Wright Aeronautical Div, Curtiss-Wright Corp, Woodridge NJ. 1903 = 12hp@1200rpm 4LW; dry wt: 170#. Wright brothers, Charles Taylor. 1904 = 39hp@1600rpm 240.52ci 4LW; dry wt: 180#. 1910 = 50-60hp 4LW. Wt: 180#. 6-60 1912 = 60-70hp@1400rpm 405.9ci 6LW; dry wt: 300#. D-1 c.1920 = 400hp@1400rpm 6LW; dry wt: 1,320#. F-50 (GR-1820) Cyclone 19?? (ATC 148, 149, 159, 198) (>ATC 169, 180, 192) = 675-760hp@2100rpm 1823ci 9RA. F-60 Cyclone 19?? = 675-760hp@2100rpm 1823ci 9RA. G Cyclone 19?? (ATC 154, 157, 171) = 760-820hp@2100rpm 1823ci 9RA; dry wt: 1,198#. G-100 Cyclone 19?? (ATC 169, 180, 192) = 860-900hp@2300rpm 1823ci 9RA; dry wt: 1,287#. G-200 Cyclone 19?? (ATC 219) = 100hp@2300rpm 1823ci 9RA; dry wt: 1,310#. GR-2600 Cyclone 14 1938 (ATC 176) = 1200hp@2100rpm to 1350hp@2300rpm 2603ci 14RA; dry wt: 1,935-1,950#. J-1 1921 = 210-245hp 727ci 9RA. Charles Lawrance. Forerunner of Whirlwind. J-3 Whirlwind 1923 = 200hp 9RA. Charles Lawrance, Andrew Willgoos. 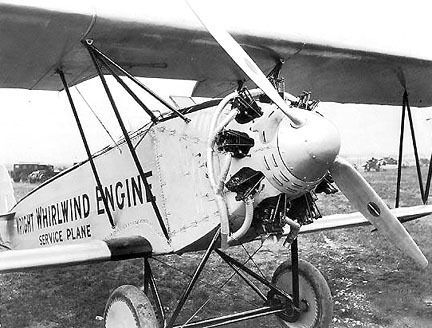 J-4 Whirlwind 1925 = 200-220hp 9RA. Charles Lawrance, George Mead, Andrew Willgoos. J-5 Whirlwind 1925 (ATC 13) = 220hp 788ci 9RA. S D Heron, Edward T Jones. J-6 Whirlwind, R-540 1930 (ATC 23) = 165-175hp 540ci 5RA. J-6 Whirlwind 7, R-760 (Curtiss-Wright) 1925 (ATC 26, 94, 126, 155) = 225-320hp 760ci 7RA. J-6 Whirlwind 9, R-975 (Curtiss-Wright) 1929 (ATC 21, 64) = 300-420hp 975ci 9RA. J65 = 1950s licensed manufacture of Armstrong-Siddley Sapphire. K-2 1922 = 350hp 8VW. P-1 1925 = 400-450hp 1654ci 9RA. From J-4, evolved into Cyclone. P-2 1925 = P-1 with centrifugal supercharging. R-1 1919 = 350hp 1454ci 9RA. George Mead, Andrew Willgoos. R-460 19?? = 225-235hp 756ci 7RA. R-600 Challenger (Curtiss-Wright) 19?? (ATC 5) = 170-185hp 603ci 6RA. R-760 military 1939 (ATC 5E-6) = 235-320hp 7RA. R-760-E (Curtiss-Wright) 19?? = 350hp 760ci 9RA. R-790 19?? = 200-300hp 7RA. R-975 military 19?? = 165hp 5RA. R-1200 Simoon 1924 = 350hp 1200ci 9RA. George Mead, Andrew Willgoos. R-1300 (Cyclone 7) 19?? (ATC 5E-14) = 700hp 7RA. R-1510 Whirlwind 14 1934 = 725hp 14RA. R-1750 Cyclone 9 1927 (ATC 17) = 525hp 1753ci 9RA. 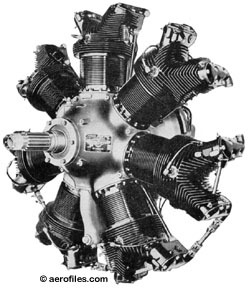 R-1820 Cyclone 9 (Curtiss-Wright) 1935 (ATC 154, 159, 157, 171, 198) = 675-760hp 1820ci 9RA. R-1820 Cyclone military (ATC 5E-10) = 850-1275hp 9RA. R-2600 Cyclone 14 19?? (ATC 5E-9) = 1350-1600hp 14RA. R-3350 Cyclone 18 1939 = 1800hp 18RA. SH-14 (Wright-Siemens) 19?? = 113hp 9RA. Licensed US manufacture of Siemens-Halske, aka Yankee Siemens. SR, SGR-1820 Cyclone 19?? (ATC 98, 101, 103, 148, 149) = 715-850hp 1823ci 9RA. Wright-Gypsy Licensed production of De Havilland Gypsy engines. L-320 1930 (ATC 40) = 85-90hp 318ci 4LA. Wright-Hisso Wright Aero Corp. 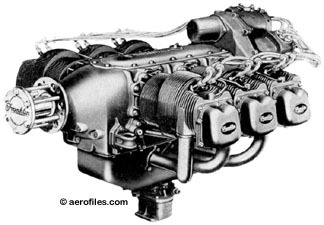 Licensed production of Hispano-Suiza engines. 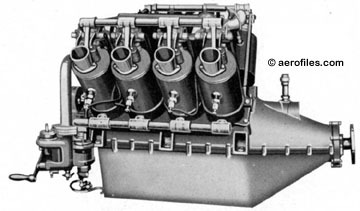 A 1919 (Group 2) = 150hp 8VW. E-2, -3, -4 1919 (Group 2) = 180hp@1800 to 215hp@2000rpm 8VW; dry wt: 465-480#. H, H-3 1919 (Group 2) = 300hp 8VW. I 1918 (Group 2) = 150hp 8VW. T, T-2, T-3 1922 = 525-675hp 1947ci 12VW. 1926 = 29hp 80ci 2HOA. Wright-Tuttle Wright-Tuttle Aircraft Motors Corp, Anderson IN. York Jo York, no location.